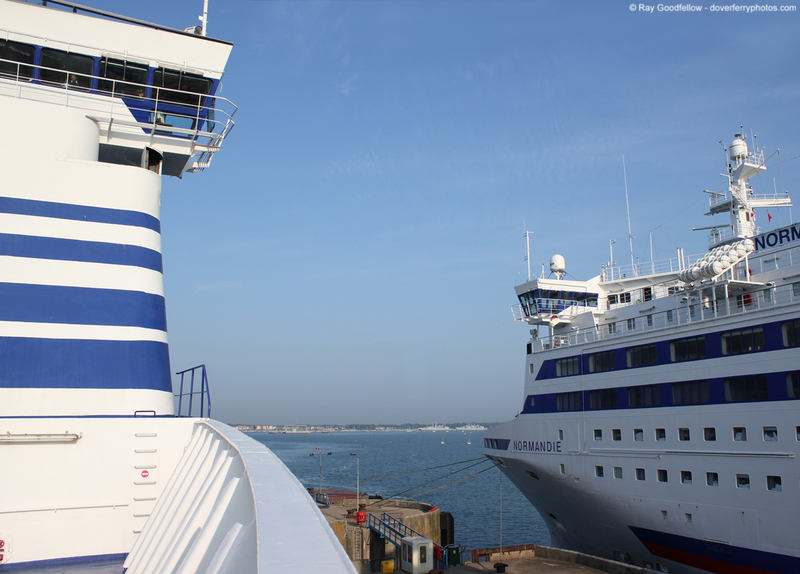 Back in May myself and Paul Cloke undertook our first voyage with Brittany Ferries on the Western Channel traveling on both the Barfleur to Cherbourg and the Mont St Michel from Caen to Portsmouth. 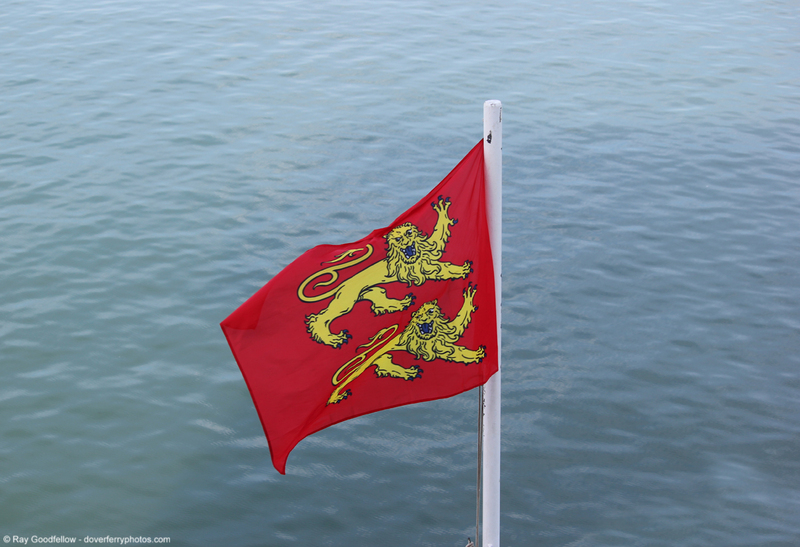 As our trip back from Caen was a delayed overnight crossing and we were very tired after a protracted stay in Normandy we didn’t really get a good chance to explore and enjoy the ship we decided we would like to sail on the Mont St Michel again, this time on a day crossing from Portsmouth. 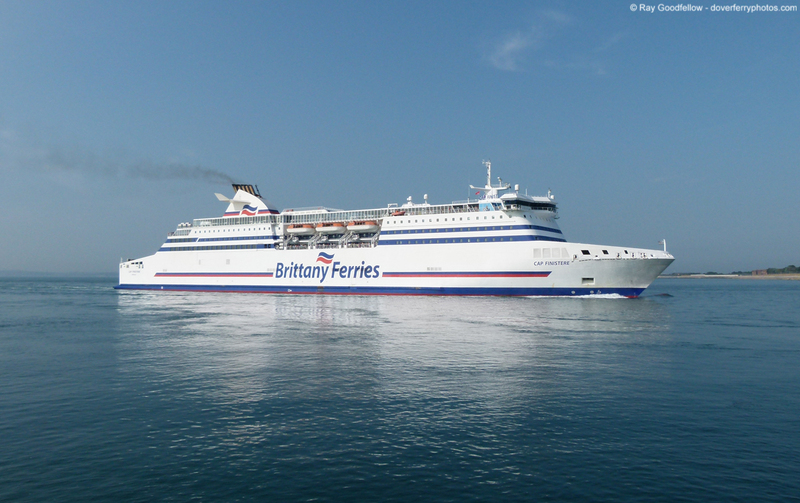 With this in mind and with Brittany Ferries rather good value day trip fares we started planning our trip. 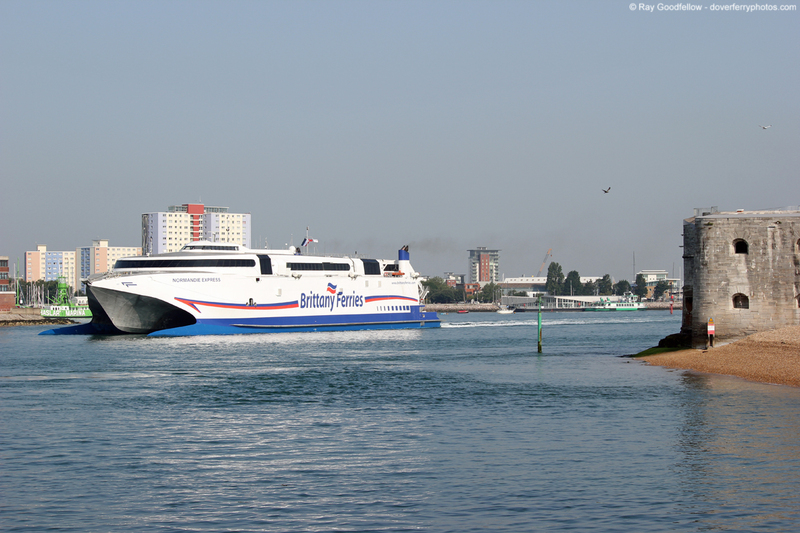 A quick look at the timetables showed that we could leave Portsmouth at 08:15 and be in Caen (Ouistreham) by 15:00. Another look at the timetable revealed that on a Tuesday the Bretagne departed St Malo in the evening at 20:30 instead of her usual lunchtime departure (this is because she usually sails overnight to St Malo from Portsmouth) and having never travelled on the Bretagne we decided to add her to our itinerary. 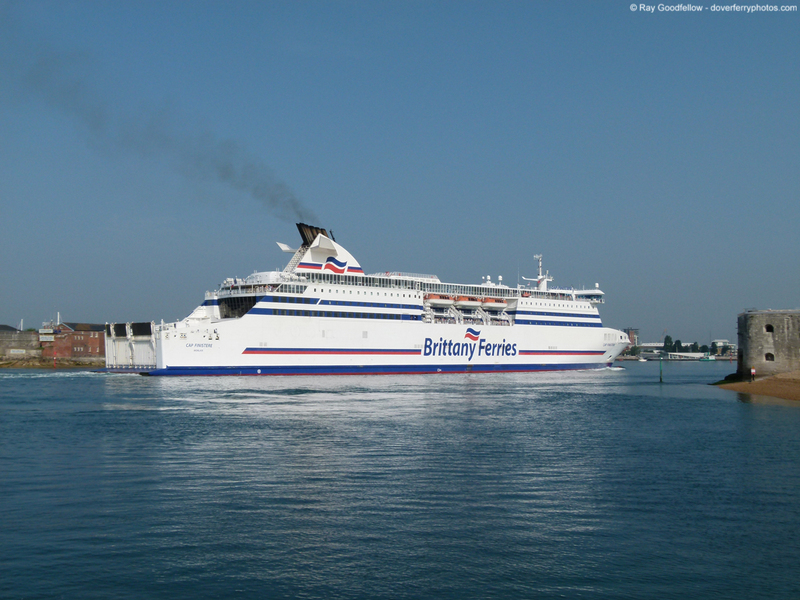 All in all our trip with Brittany Ferries came in at £130 based on a vehicle with 2 adults sailing from Portsmouth to Caen (Ouistreham) returning St Malo to Portsmouth with a 4 berth outside club cabin. Just like our previous voyage in May we had some spare time upon arrival before we had to make the journey home so we decided to travel to the Isle of Wight again, this time as foot passengers with Red Funnel from Southampton to East Cowes on the Red Eagle returning from West Cowes on the Red Jet 4. 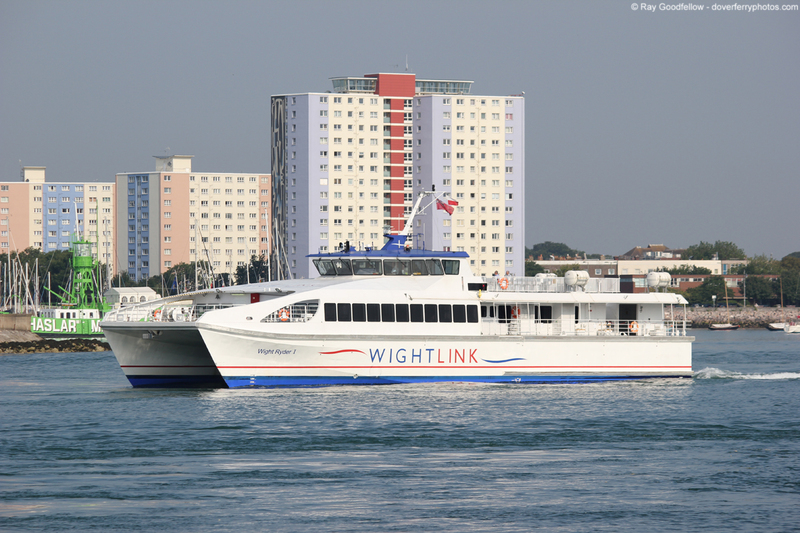 I will state now that due to the heat (30 degrees in Southampton and Cowes) and how busy it was I didn’t take any photos on this part of the trip and will therefore not include it in this voyage report. 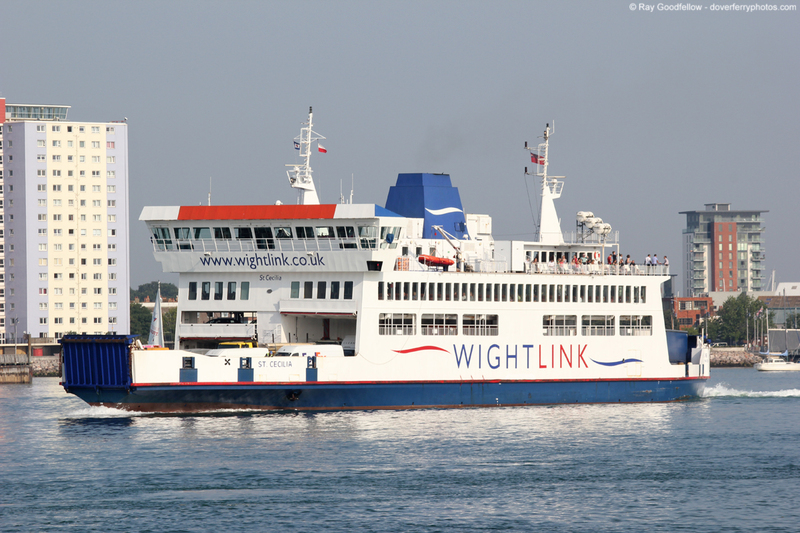 All I will say it was nice to enjoy a cooked meal on an Isle of Wight ferry and it was nice to just enjoy the journey whilst not being behind the viewfinder. As in the previous voyage report I am not going to go into extensive detail, I will outline my views and there will be a large number of captioned photographs detailing the voyage and what was seen on route. Once again on this voyage I made extensive use of Instagram. My Instagram photos are available as a separate gallery and can be accessed here. 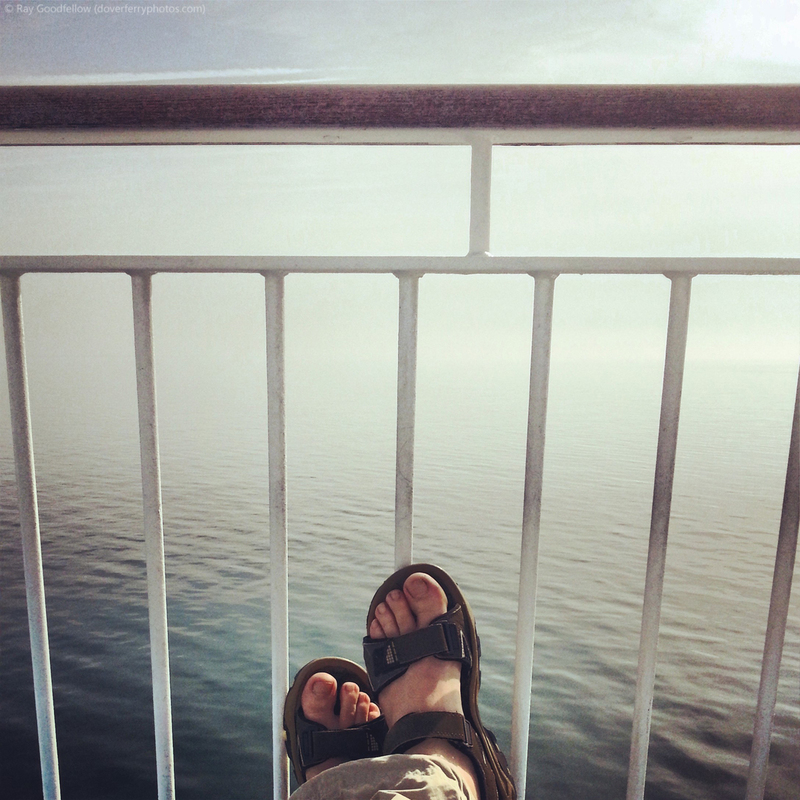 I will also warn you that this voyage report contains quite a few references to food 🙂 Well I am on my summer break from work and with my birthday coming up next week I thought I would start the celebrations a bit early by relaxing and enjoying some nice food. 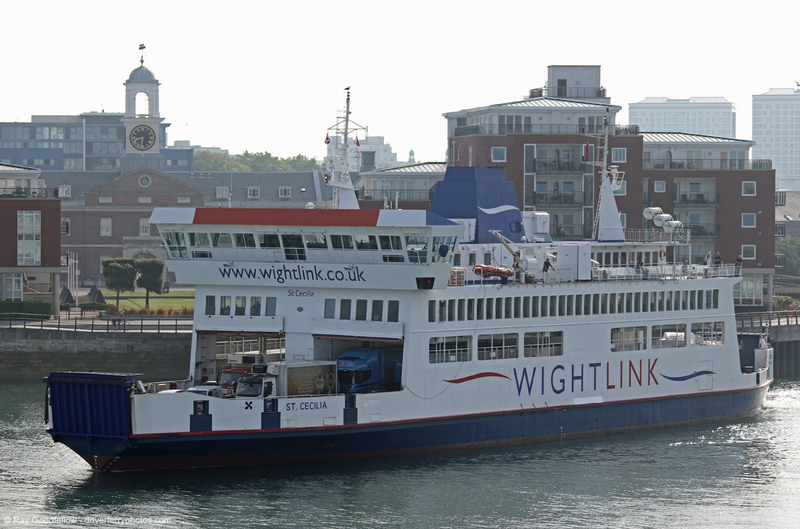 Having stayed on the outskirts of London overnight we departed at 0445 for Portsmouth, thankfully the roads were clear and within an hour and 45 mins we had arrived at Portsmouth International Port. 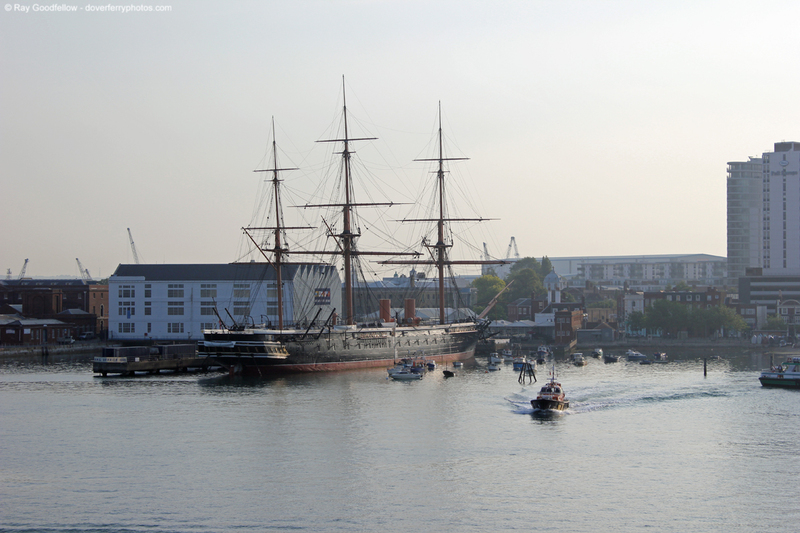 The weather in Portsmouth was outstanding, no wind clear sky and warm. 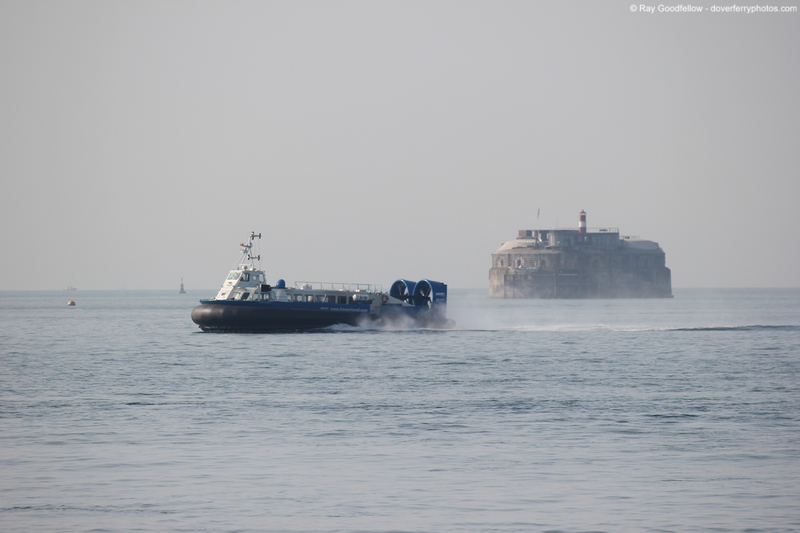 It was evident from our run in that there was a fair amount of mist and fog out at sea and the Isle of Wight could barely be seen. After a very quick check in we were soon parked up in the lanes waiting to go through immigration and security. 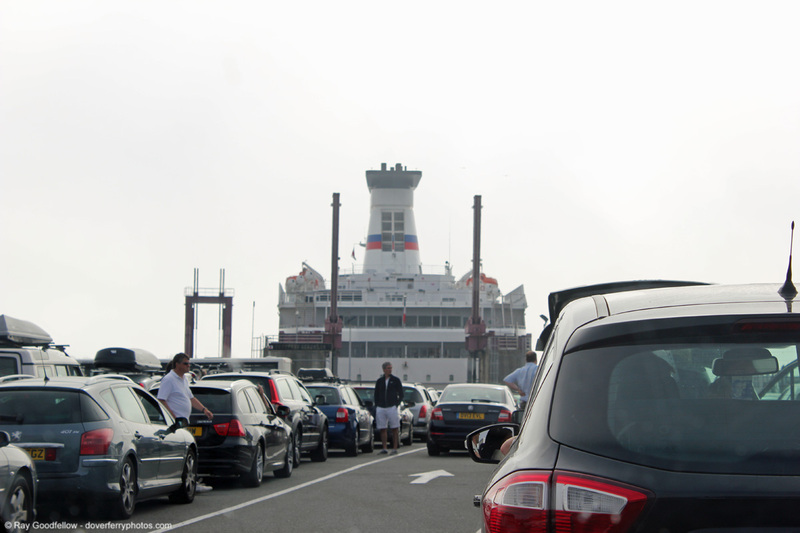 Brittany Ferries were checking vehicles in for both the 08:15 to Caen and the Normandie Express‘ 0900 to Cherbourg. 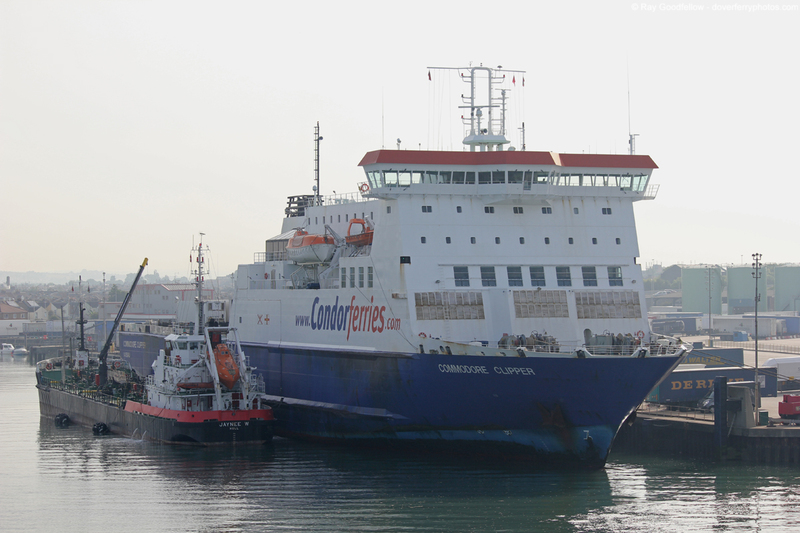 Also present in the port was Condor Ferries Commodore Clipper having recently arrived from the Channel Islands. With time to spare we entered the terminal building for a coffee. This was my first time in the new terminal building and I have to say I was very impressed with it, especially when you compare it to the old one. The new terminal is of a steel and glass construction and is very light and airy, you certainly couldn’t say that about the old terminal which was a rather depressing place if I am honest. After a brief wait we were soon called through security and were heading to wait at the Mont St Michel’s berth. 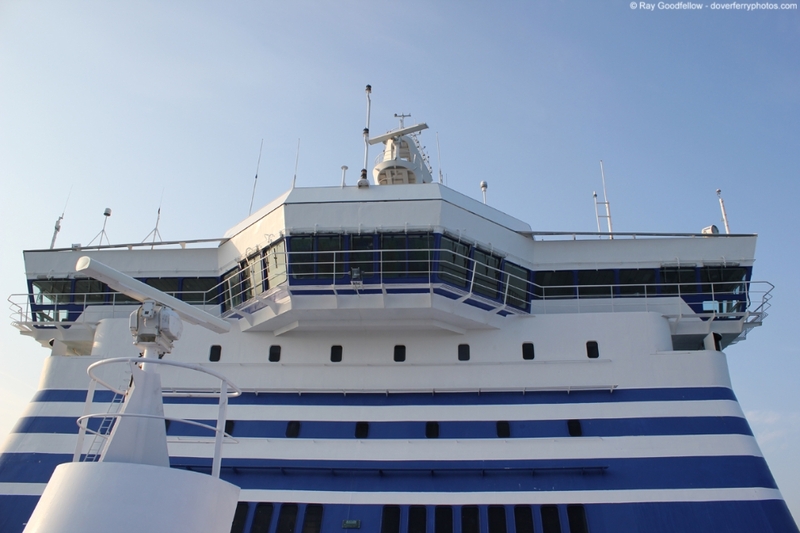 After another 20 minutes we were called forward for embarkation and we were soon driving onto deck 5 (upper car deck) and heading up into the passenger accommodation. 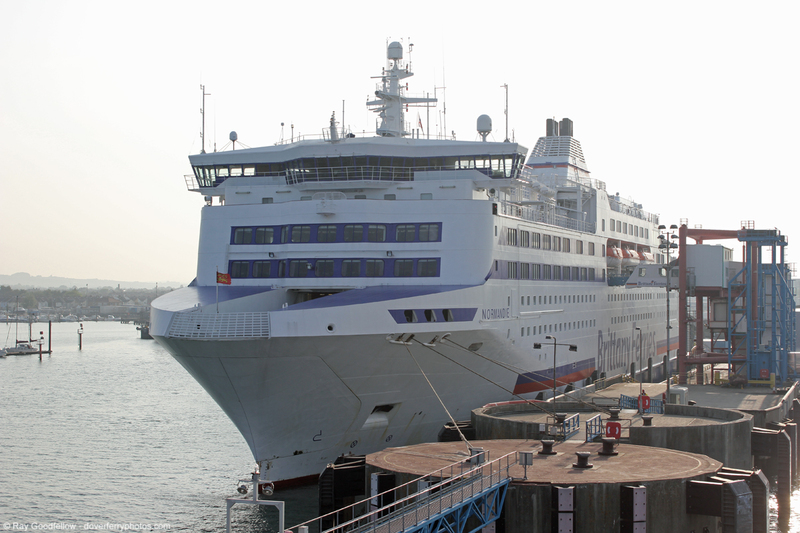 Launched at the Dutch yard of Van der Gissen-de Noord in 2002 the Mont St Michel entered service with Brittany Ferries on the 20th December 2002. 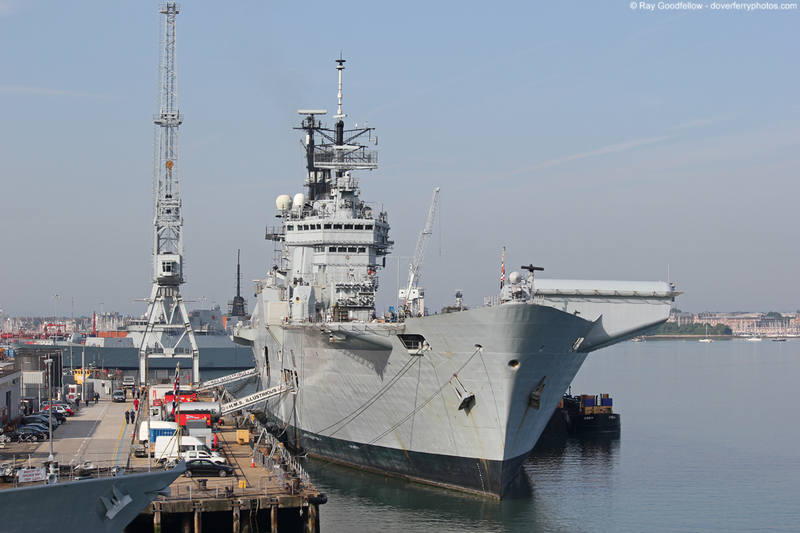 She weighs in at 35,592 gross tonnes and has a length of 173 metres and a breadth of 28.5 metres. 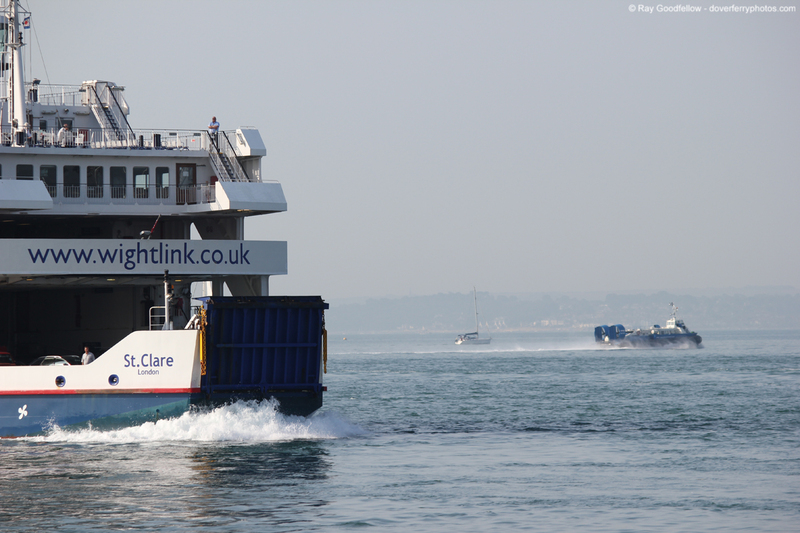 She is capable of carrying up to 830 cars or 2250 lane metres of freight and can accommodate 2123 passengers. 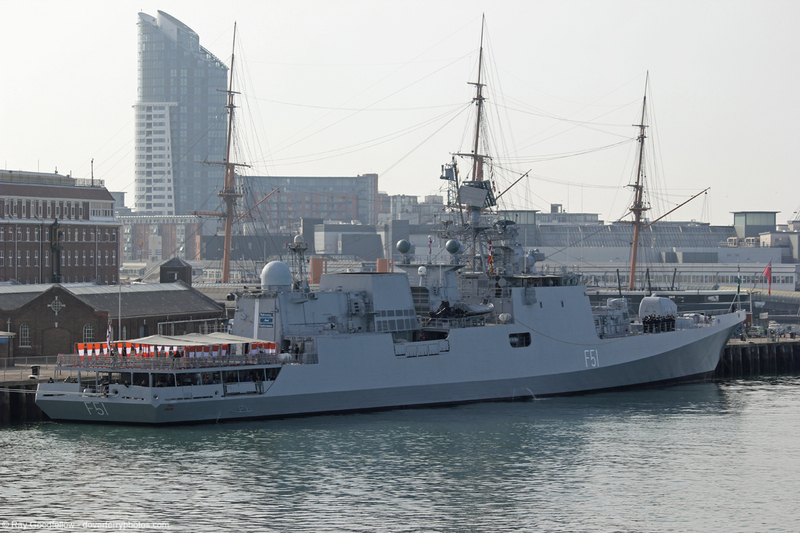 Powered by four MaK diesel engines she has a service speed of 22 knots and can make the crossing to Caen (Ouistreham) in about 6 hours. 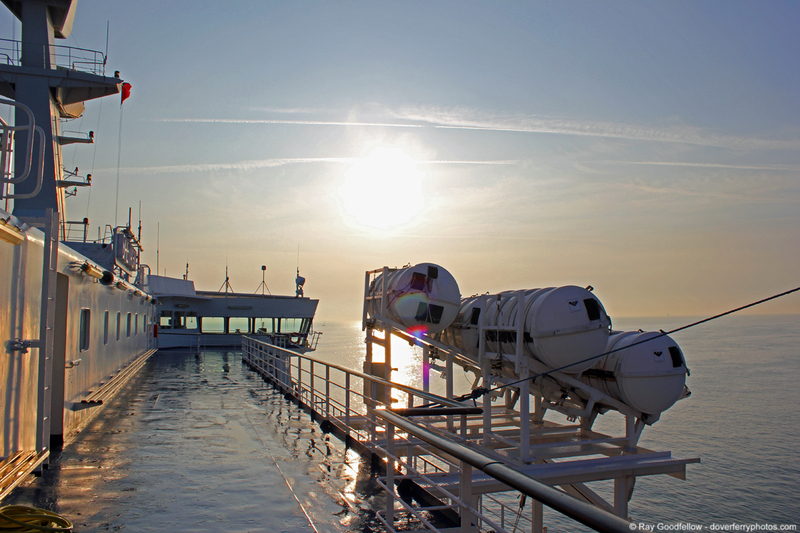 One of the nice things about the Mont St Michel is that she has a forward facing viewing deck situated on Deck 7. Last time we travelled on her this area was closed, not surprising really as it was dark and the weather had been particularly bad on her previous crossing. Now you may be asking why it was so important for this area to be open? 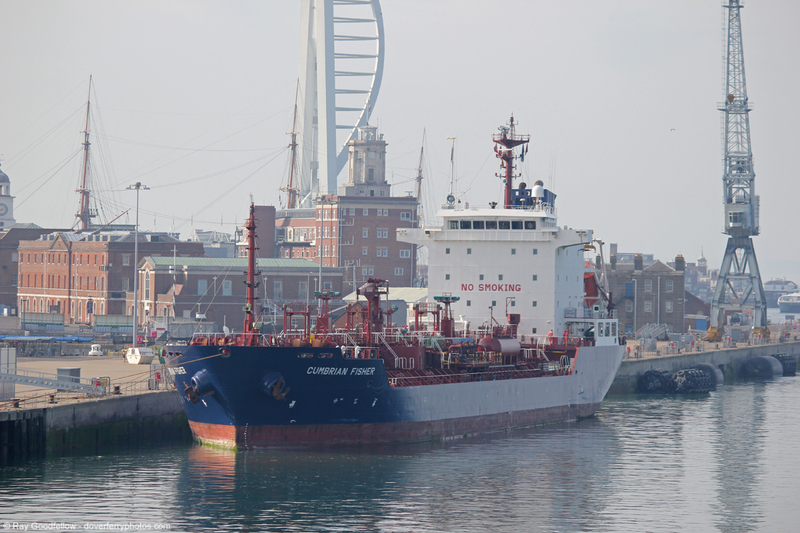 Well anybody who has sailed in and out of Portsmouth will know that there is a lot to see and more so in my case, photograph and this area gives excellent views out across the bow. 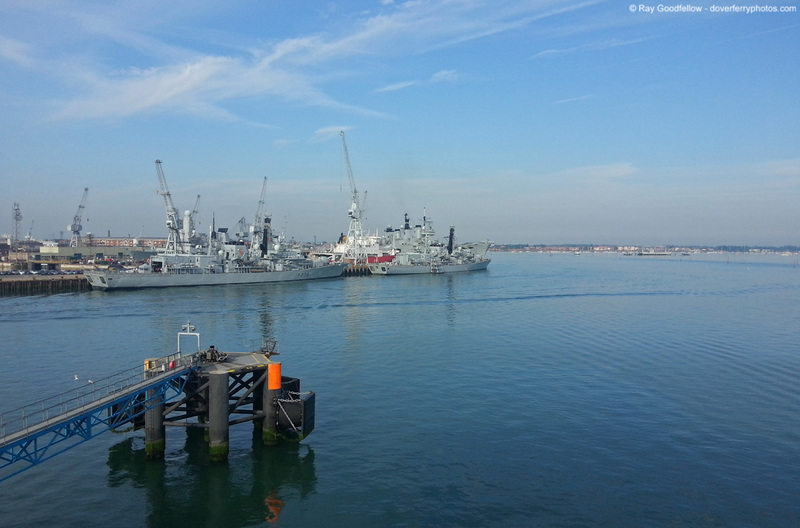 All too soon we cast off our mooring ropes and were slowly thrusting off the berth and out past Portsmouth naval dockyard before turning to Port to pass through the harbours narrow entrance and out into the Solent. 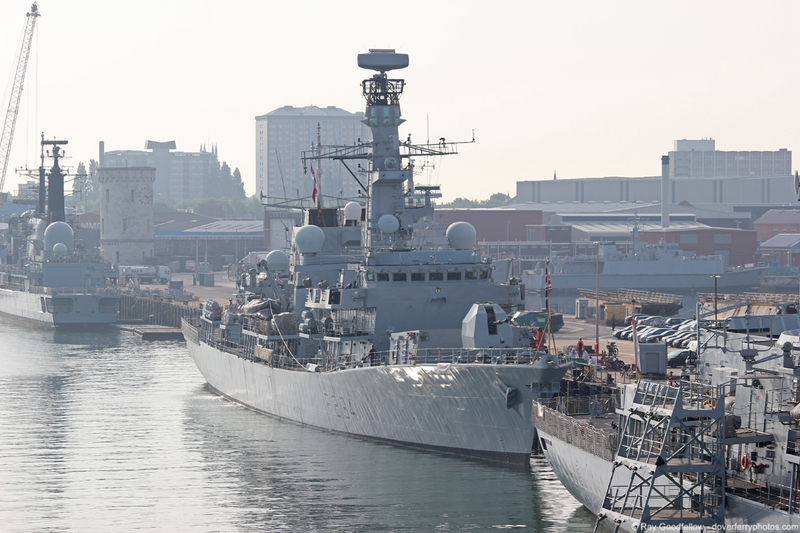 Underway from Portsmouth International Port, next stop Caen……..
With the departure from Portsmouth well and truly documented it was time for a well earned breakfast. We headed to La Galerie, the self service restaurant up on deck 8 to see what was available. Now Brittany Ferries being a French operator offer a full range of freshly baked croissants (which are very nice) and everything else you would expect for the continental breakfast but they also do a very good English Breakfast for just £4.95! 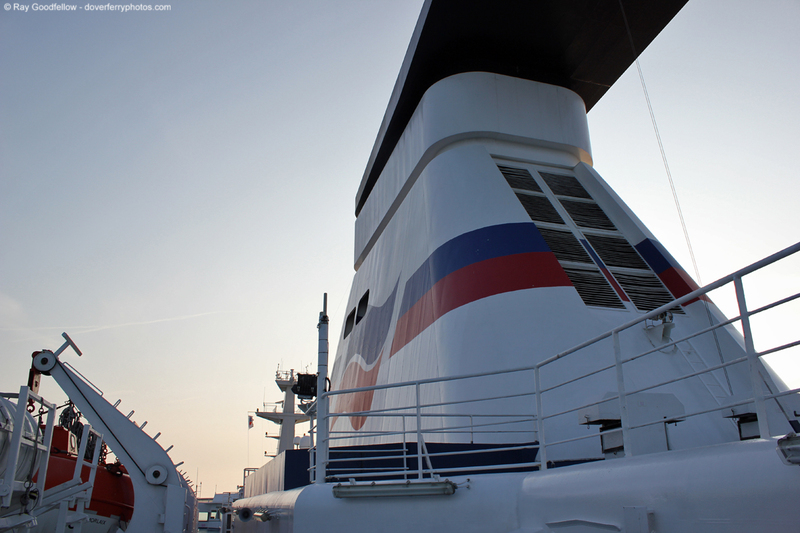 When you compare this to some of the prices the short sea operators charge it’s very good value indeed. 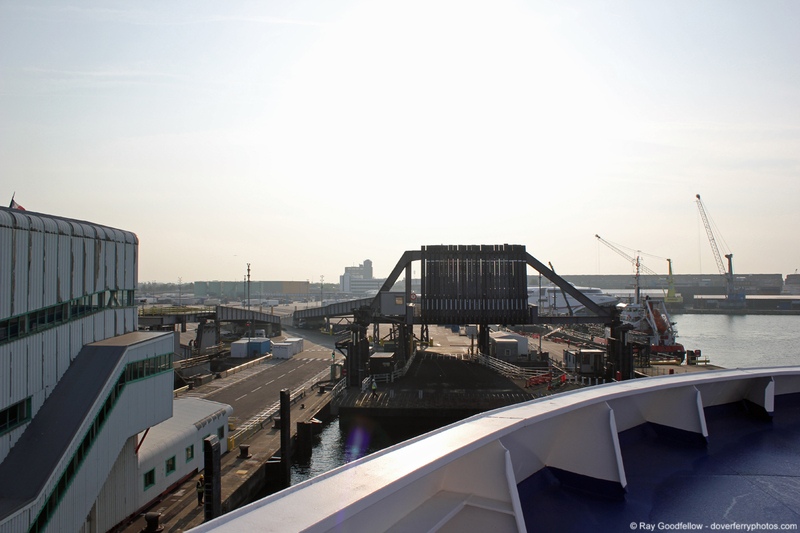 Breakfast was enjoyed looking out over the bow and now it was time to settle into our 6 hour crossing to Lower Normandy. 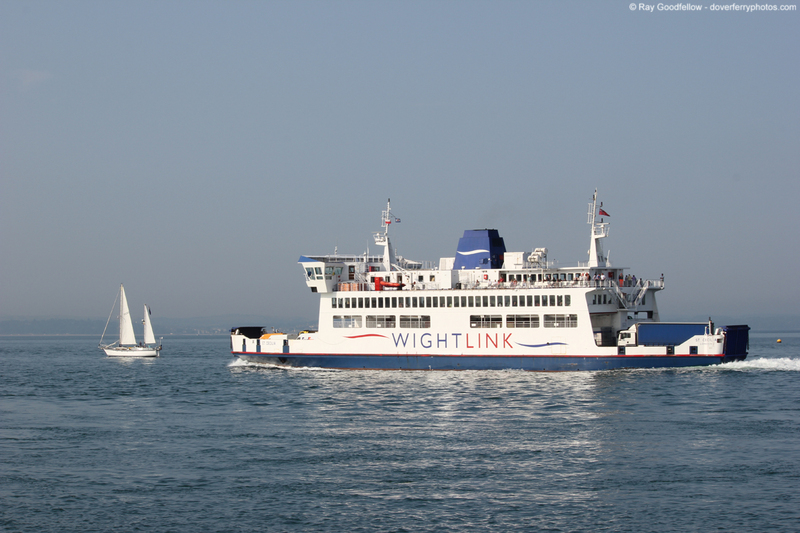 To some the thought of spending 6 hours at sea sounds boring but trust me time soon whizzes by, especially on a bright sunny day. 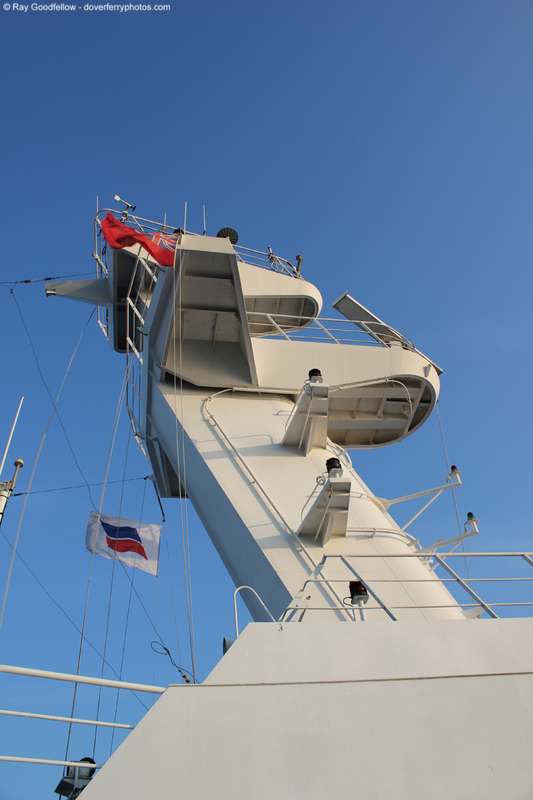 After an exploration of the ship we headed up to Deck 10 to enjoy some beautiful sunshine. Out on deck it was lovely and warm with light winds but visibility wasn’t brilliant. 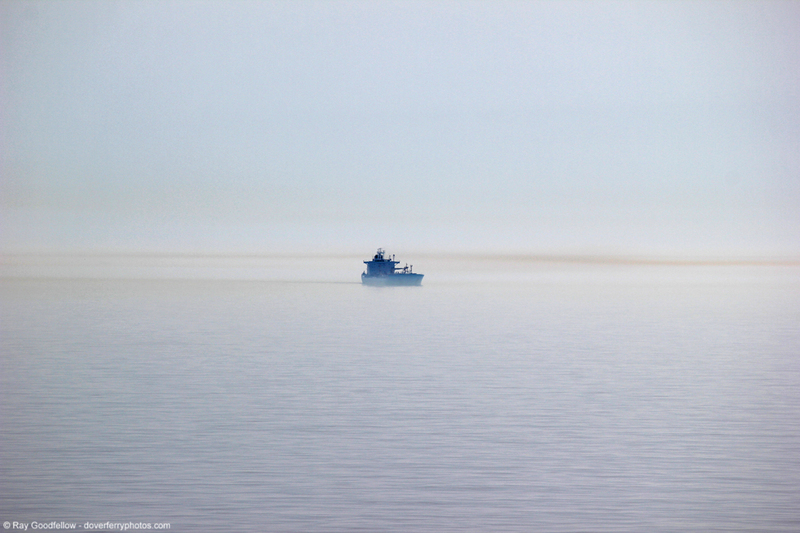 To use the expression, the sea really was as calm as a mill pond. After a while on deck just chilling out and relaxing it was time for a snack, yes I did have a cooked breakfast a few hours earlier but I am on holiday and intended to enjoy this as much as possible. We headed down to Le Café du festival on deck 9 and were greeted with a vast selection of patisserie, drinks and sandwiches. We could have even had a pizza with our own choice of toppings cooked fresh. 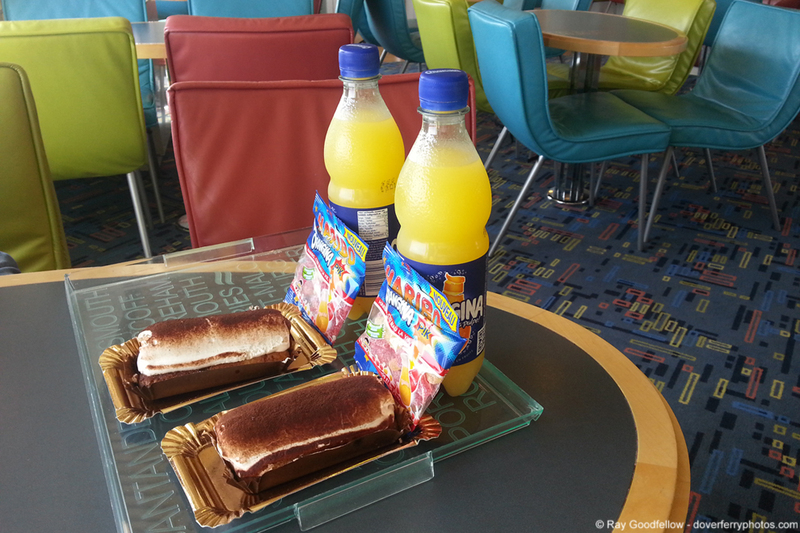 As it was only elevensies (yeah I know, any excuse) we opted for tiramisu and a drink of Orangina. Again we headed to La Galerie, the self service restaurant up on deck 8. 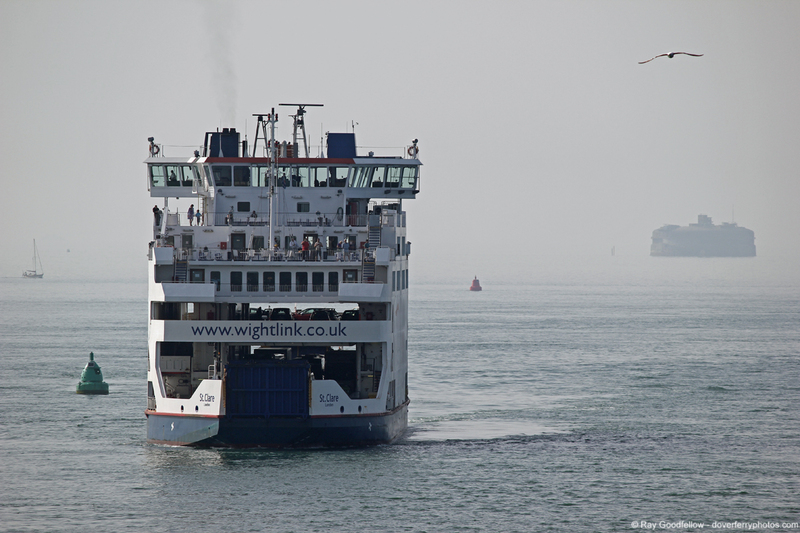 There was an extensive menu available from salads through to the usual food fare available on any cross channel ferry. We both decided to go for the `Dish of the day’ which was roast beef which was freshly carved in front of us, it was about the thickness of a rump steak and I opted to have this with French fries and peppercorn sauce and it was absolutely gorgeous. The beef was cooked to perfection. Again I found the cost of the food to be very reasonable, mine came to £9.35 with a drink. After lunch we again headed for the front deck to while away some more of the journey. 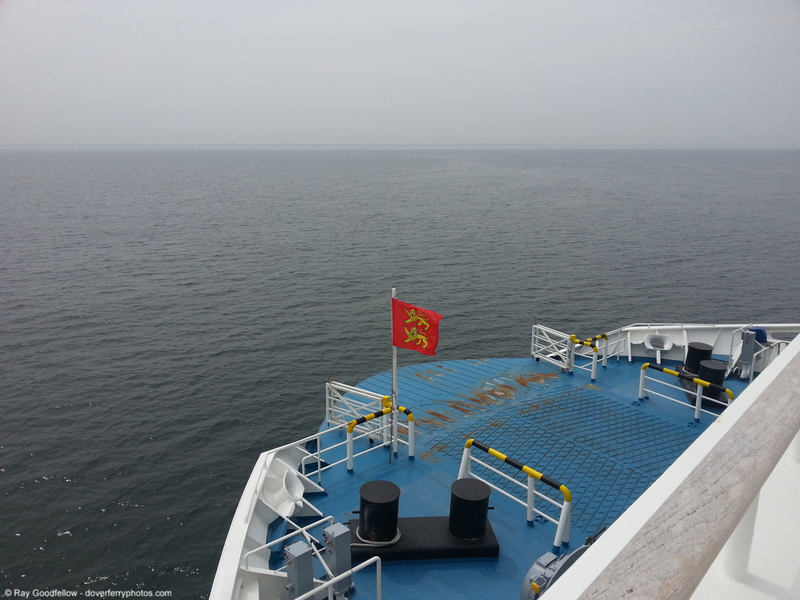 Due to the poor visibility we couldn’t really see the Normandy coast but the increase in coastal shipping and seabirds was a clue that we were getting closer to the Port of Ouistreham and soon the port could be seen on the horizon. Before too long we were on the car deck and driving off in Normandy. 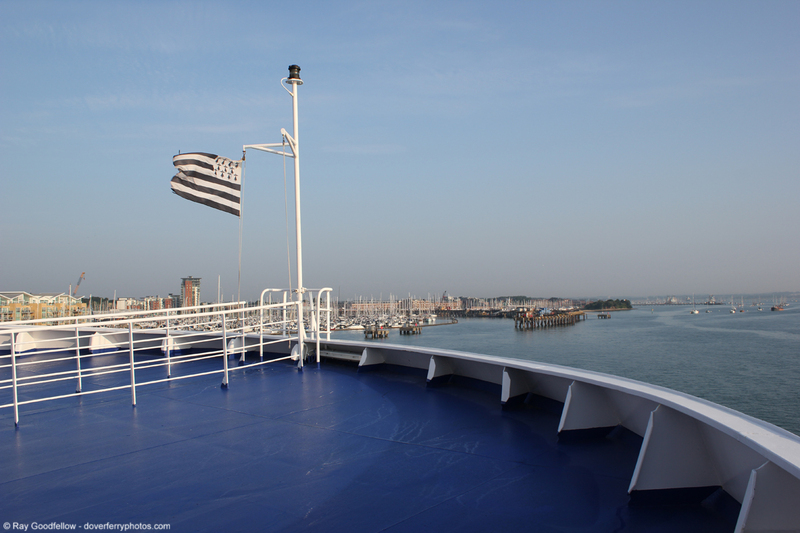 After clearing Immigration we were on our way to the Breton port of St Malo for the next leg of our journey. The journey to St Malo was painless and we passed a lot of picturesque countryside, including the Mont St Michel (the island not the ship). You could tell the Tour de France had been in the area the week before by the amount of graffiti painted on the roads and the number of bicycle inspired displays in the various towns and villages we passed through. We arrived in St Malo with plenty of time to spare so did the usual thing that all Brits abroad do, we went to the hypermarket on the outskirts of the city to purchase the list of food that had been passed to us before departure. All too soon we were heading towards the port to check in for our return crossing to Portsmouth. 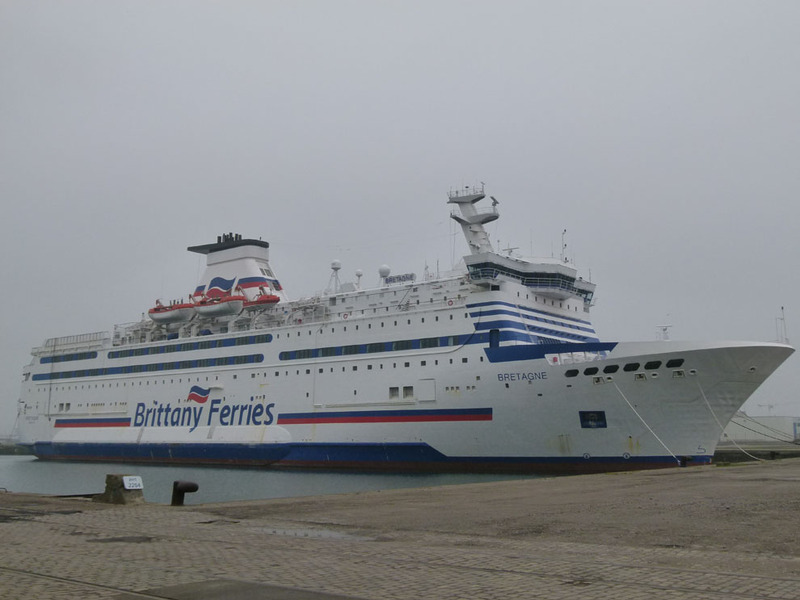 Whenever I have spoken to anybody in the maritime community about travelling by Brittany Ferries they always say the same thing “You must travel on the Bretagne” so with an evening departure from St Malo on the timetable this was the perfect opportunity. 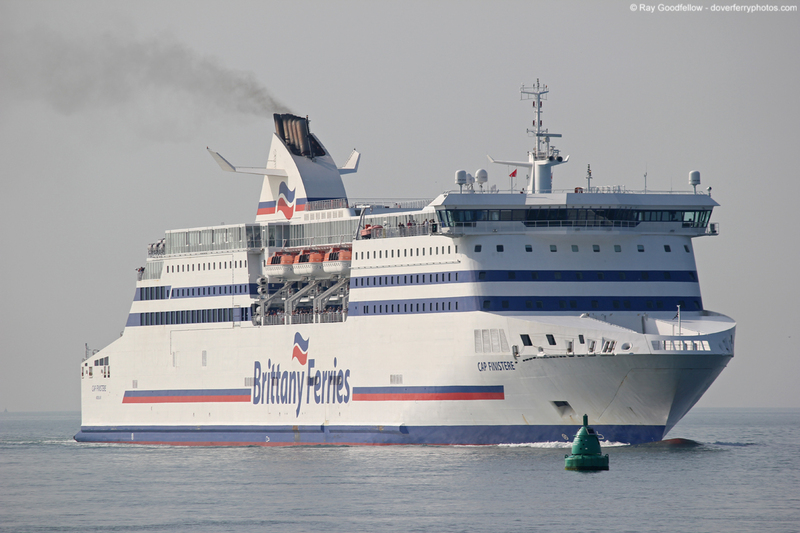 Launched at the Chantiers De Atlantique shipyard in St Nazaire, France in 1989 the Bretagne entered service with Brittany Ferries on the Santander run on the 16th July 1989. 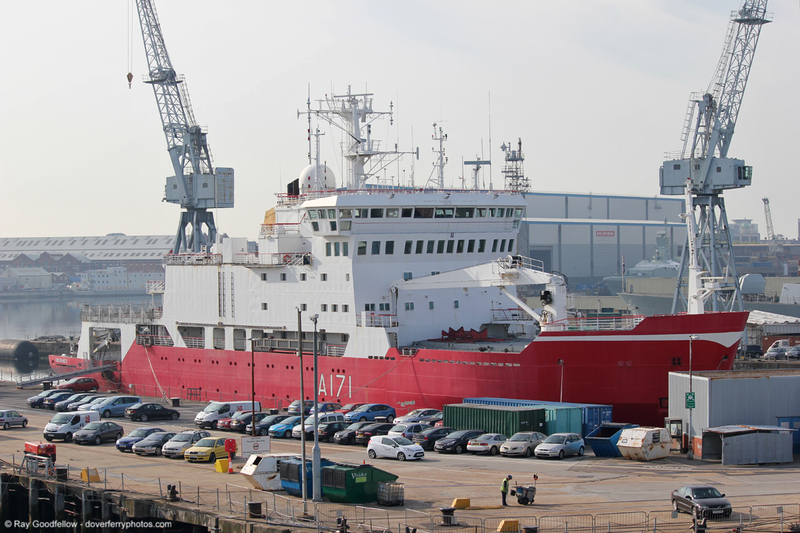 She weighs in at 24,534 gross tonnes and has a length of 151.2 metres and a breadth of 26 metres. 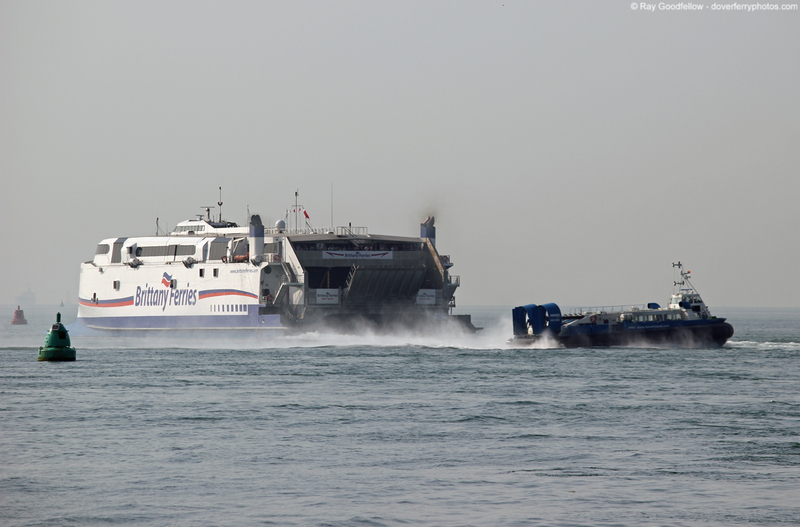 She is capable of carrying 2056 passengers, 650 cars or a mix of 200 cars and 62 freight vehicles. 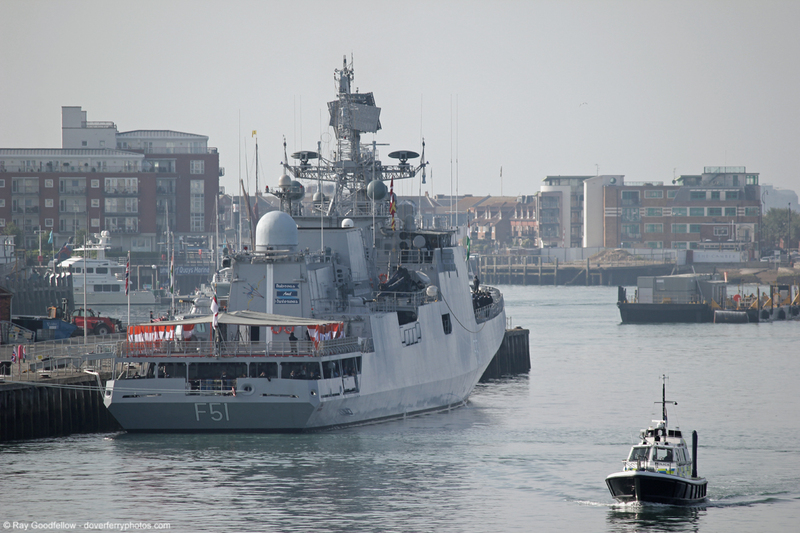 She is powered by Four Wärtsilä-Crepelle diesel engines and has a top speed of 21 knots, she is capable of completing the crossing from St Malo to Portsmouth in 10 hours during the day and 12 hours overnight. 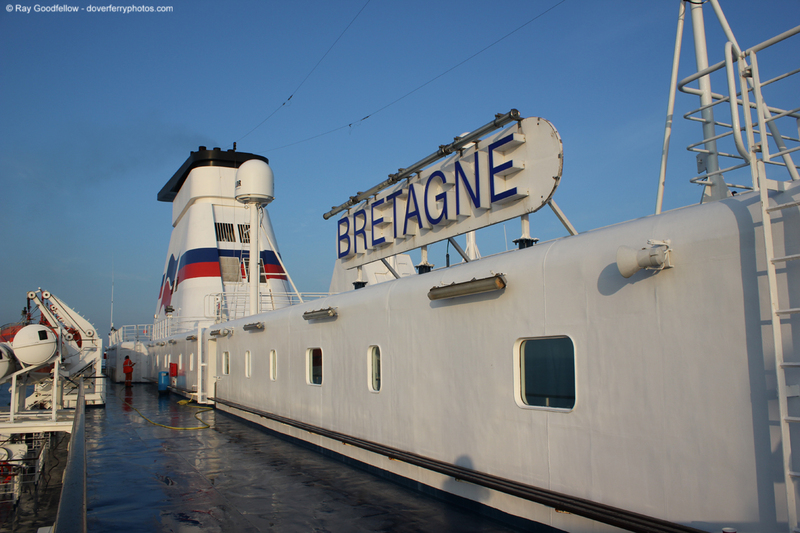 A full history of the Bretagne is available in our Past and Present section. 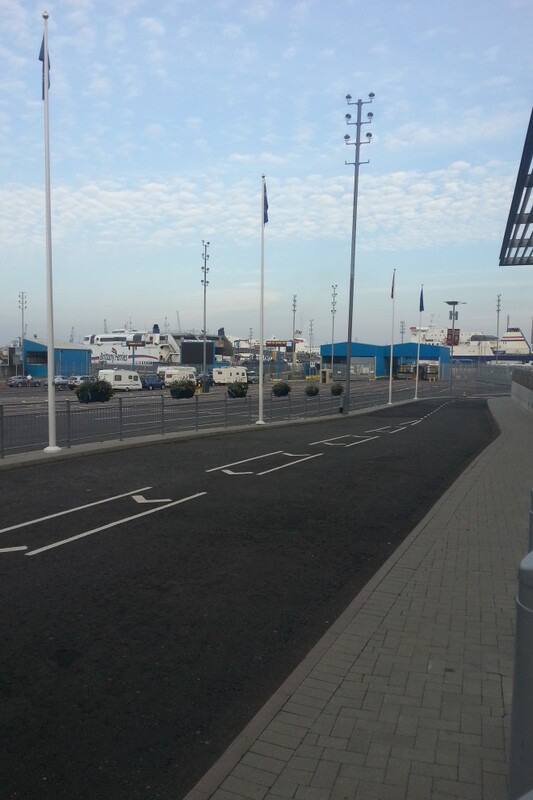 We checked in an hour and a half before our sailing and from the amount of traffic waiting it was evident that it was going to be a busy crossing with numerous caravans and motorhomes waiting to head home to Britain. 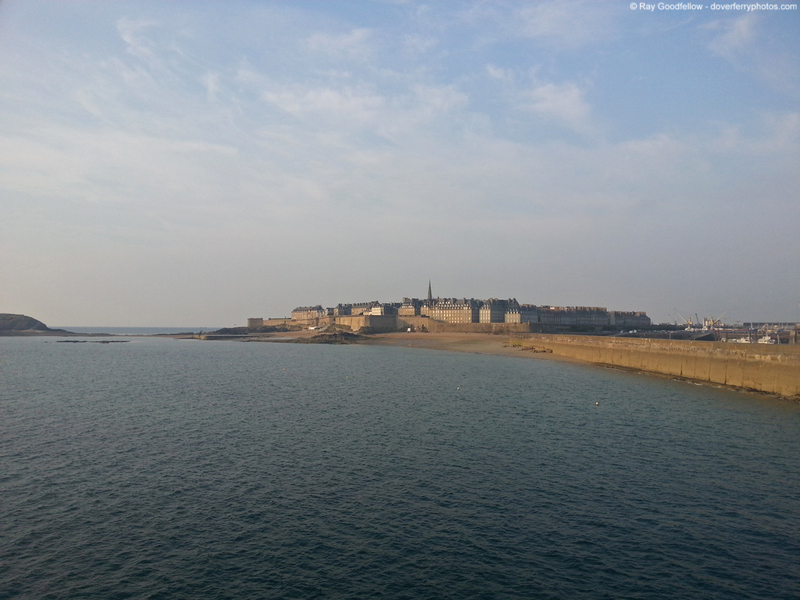 The weather in St Malo was very pleasant with lots of evening sunshine but every so often a thick bank of fog would blow in blocking the views of the port. Now for my one and only gripe of the whole journey. 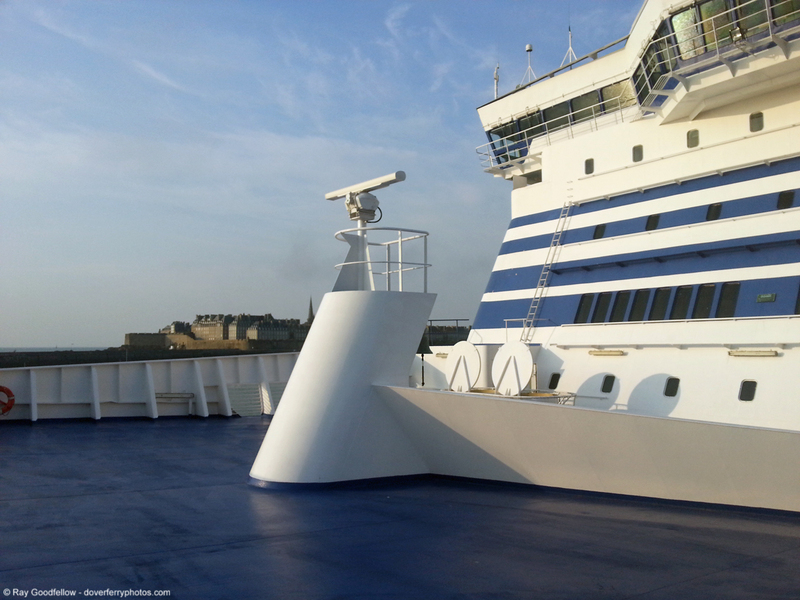 The loading procedure in St Malo appeared to be somewhat disorganised, I even heard a fellow passenger describe it as “Shambolic”. There was a lot of traffic waiting to board and the loading process didn’t get underway until 1 hour before departure. 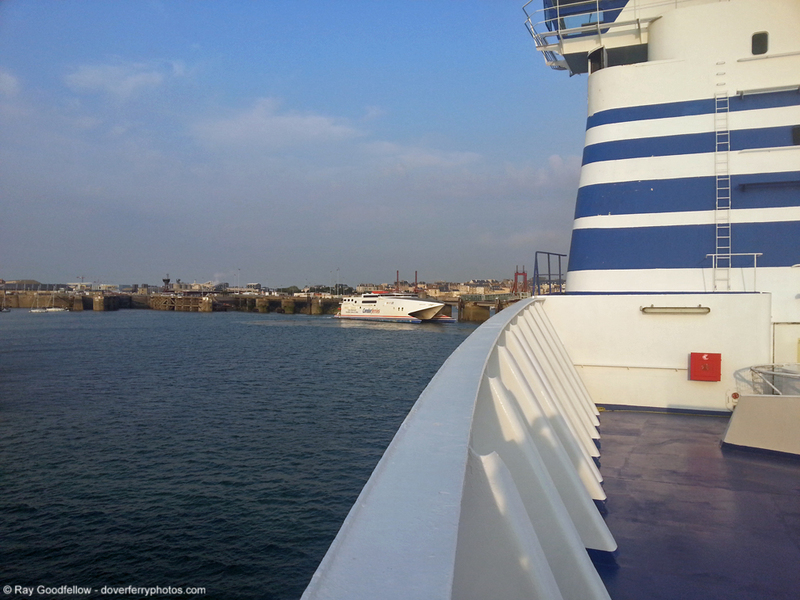 It certainly wasn’t as smooth as it could have been but I wasn’t going to let it spoil my trip on the Bretagne. 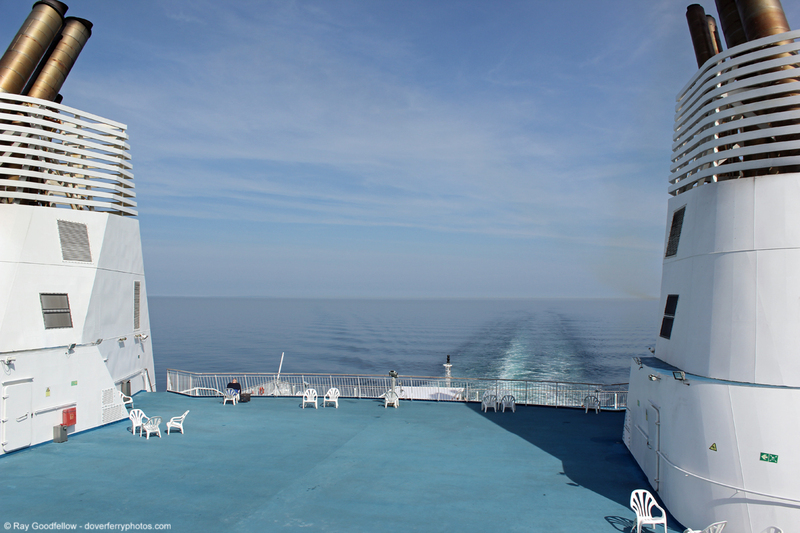 We eventually boarded at 1945 and were directed up to Deck 5, this is the upper car deck which operates on a U-turn system similar to the upper car deck on the DFDS D class vessels and P&O Ferries Spirit Class vessels. 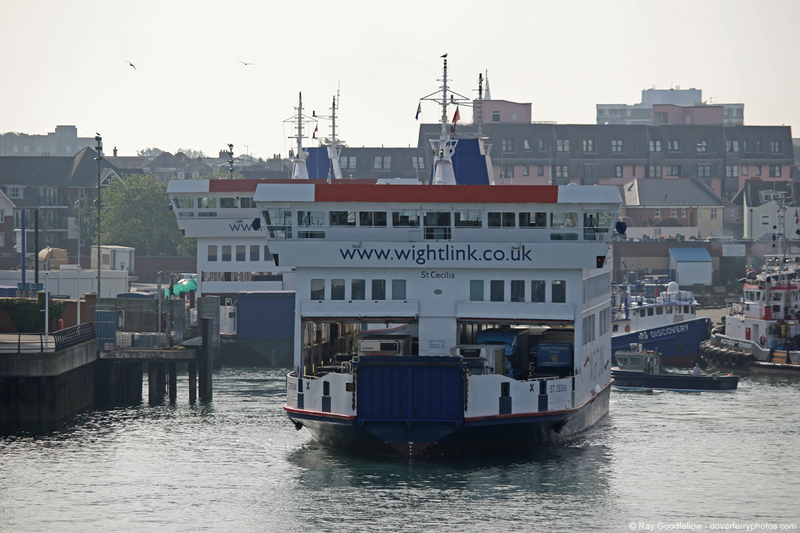 Once we had parked we were soon heading up the stairs to the passenger accommodation. For this journey we had booked a cabin. Instead of going for a standard 2 berth inside cabin we booked a 4 berth outside club cabin. It was only £15 more than a 2 berth cabin but for the additional money we obviously got more space, a window, tea and coffee making facilities and a TV, all in all worth the additional expense. After the heat of the day I am happy to report that the air conditioning in the cabin was working and was a welcome relief. 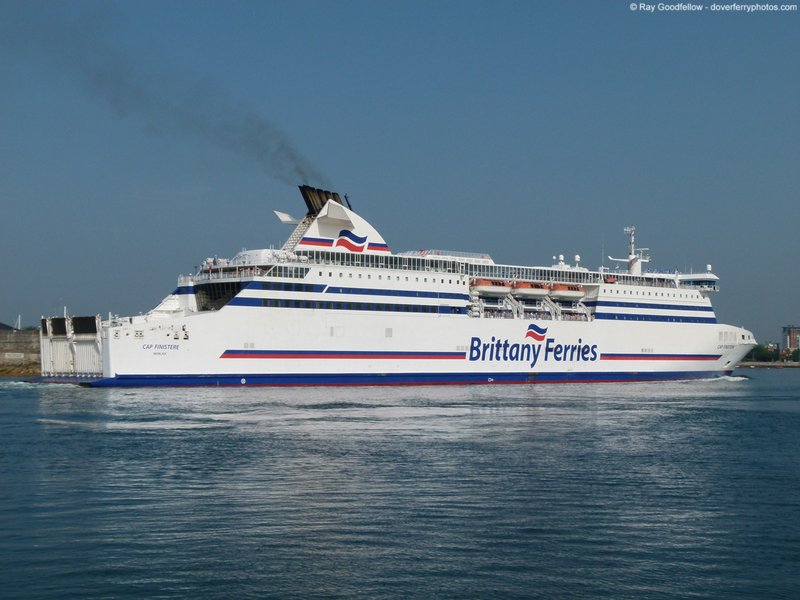 One thing I will say about the the Bretagne is that she is not a new ship by today’s standards but the ship herself is well fitted out and is clean and apart from the odd mark on the carpet you wouldn’t really know you were travelling on a ship that is 23 years old. 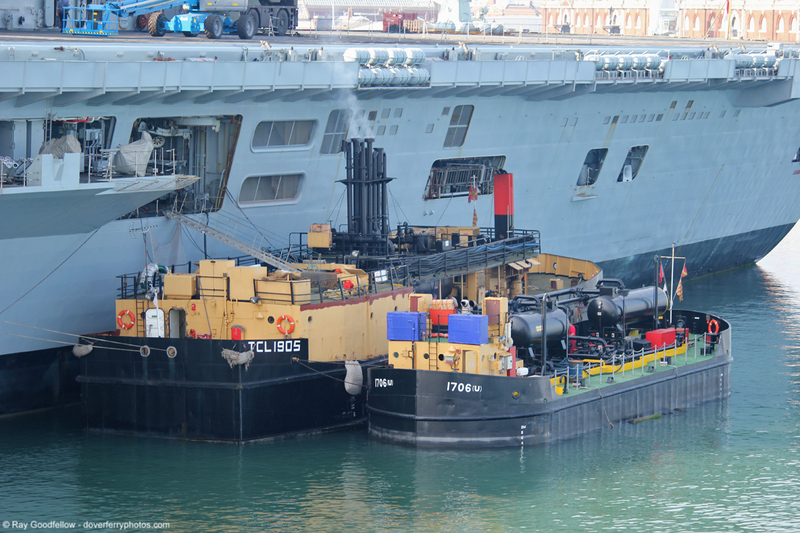 She is well looked after by her crew and she has a very loyal following. 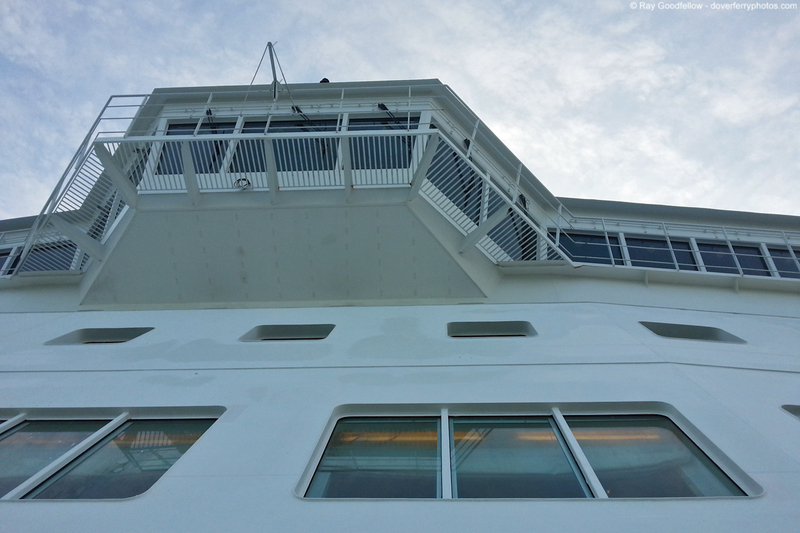 After a shower we headed out to the forward sundeck to witness our departure from the port. Unlike the small bow sundeck on the Mont St Michel the Bretagne‘s covers the entire bow section, almost to the jackstaff. Certainly something different and the perfect place to watch our departure from. We eventually got underway at 2045 and headed out into the bay of St Malo and passed the numerous islands and rocky outcrops into the setting sun. After witnessing our departure it was time to turn our attention to food once more. 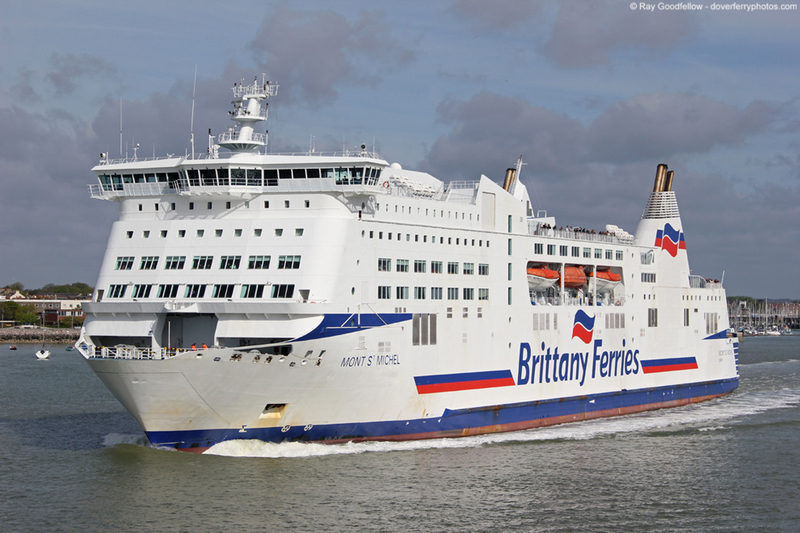 Another theme that seems to be associated with Brittany Ferries is the quality of their food. 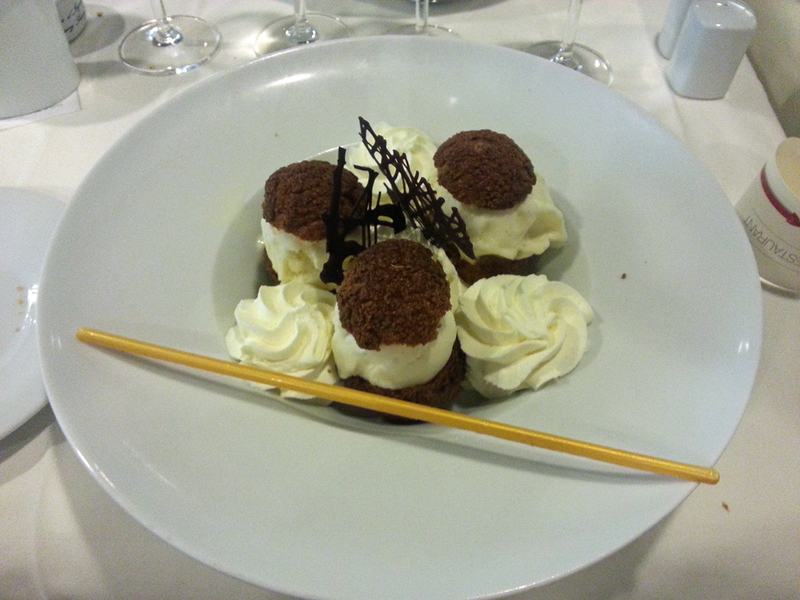 With my birthday fast approaching we decided to try the `Les Abers’ a la carte restaurant.. Situated at the stern of deck 7 the restaurant is beautifully fitted out with marble, plants, architectural pillars and a lot of Breton works of art. We had a look at the menu and instead of going for the buffet we decided to go for the full a la carte menu. We were seated immediately and drinks were offered. After settling down to enjoy our drinks our food order was taken. We both decided to go for the variation autour de la coquille saint-jacques (Scallops prepared in four different ways) for starter, filet de boeuf rôti à la mathurini (Roast fillet of beef served in a pepper and raisin sauce) for main and profiteroles à la vanille et au chocolat (Profiteroles with vanilla ice cream served with Chantilly cream and hot chocolate sauce) for dessert. 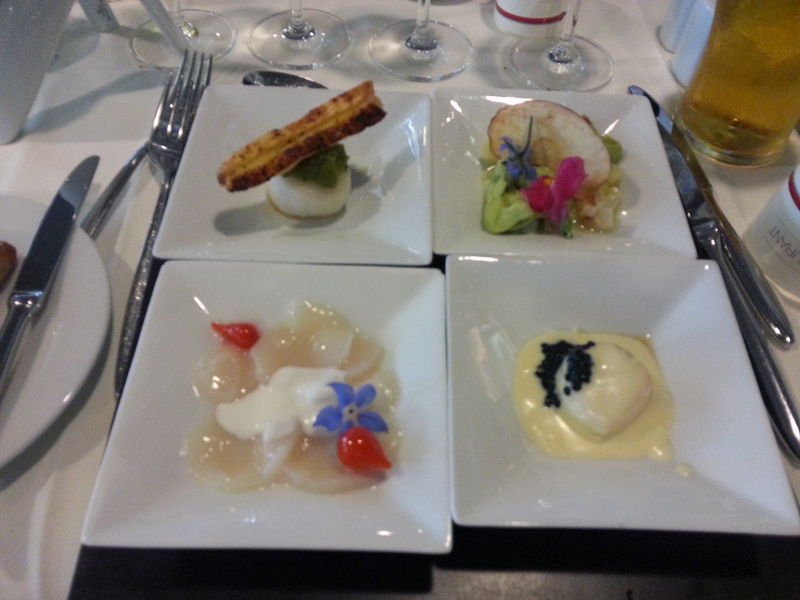 Our starters arrived quickly and all I can say is wow………………. 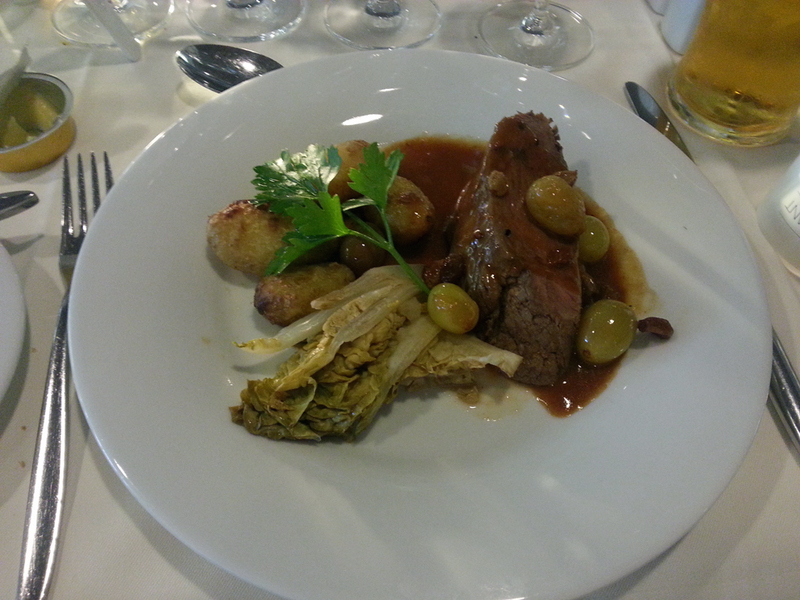 Again the main course was perfectly cooked and was presented beautifully. I personally would never have thought of putting grapes with fillet of beef but it worked incredibly well and tasted amazing, I have heard of the expression of beef just melting in the mouth and in this case it was absolutely true. After finishing our main we were offered some cheese and crackers before our dessert was delivered. All in all the whole meal was fantastic, not just the food but the service and the quality of service received was exemplary. Now to the price, it was a set price menu coming in at £30.40 a person excluding drinks. Although not cheap it wasn’t expensive either when you consider the quality of the food and the quality of the service received. 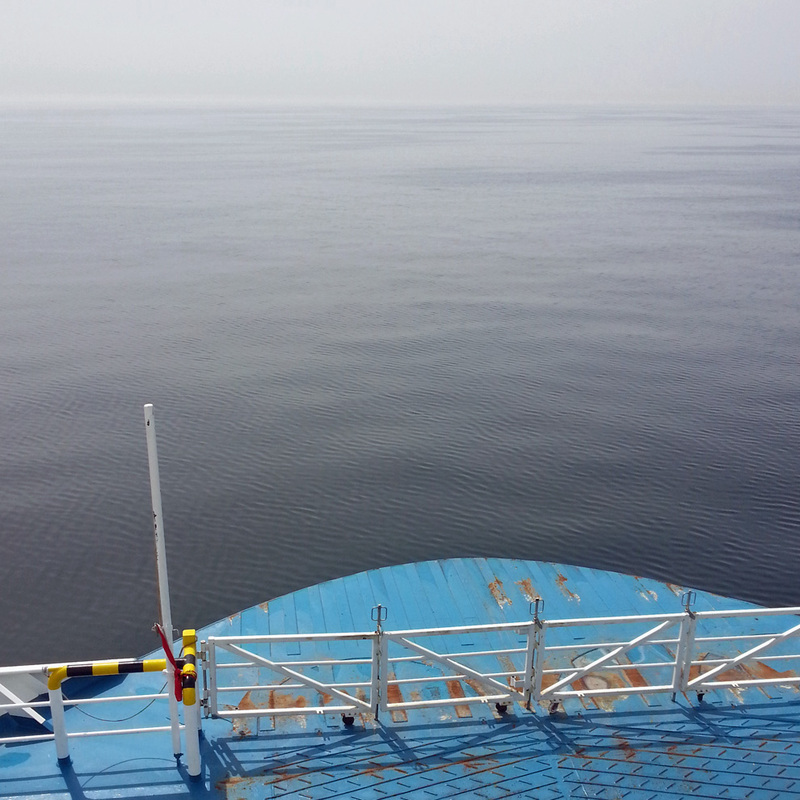 After our hearty dinner we took a stroll on deck before retiring to our cabin and a well deserved sleep. 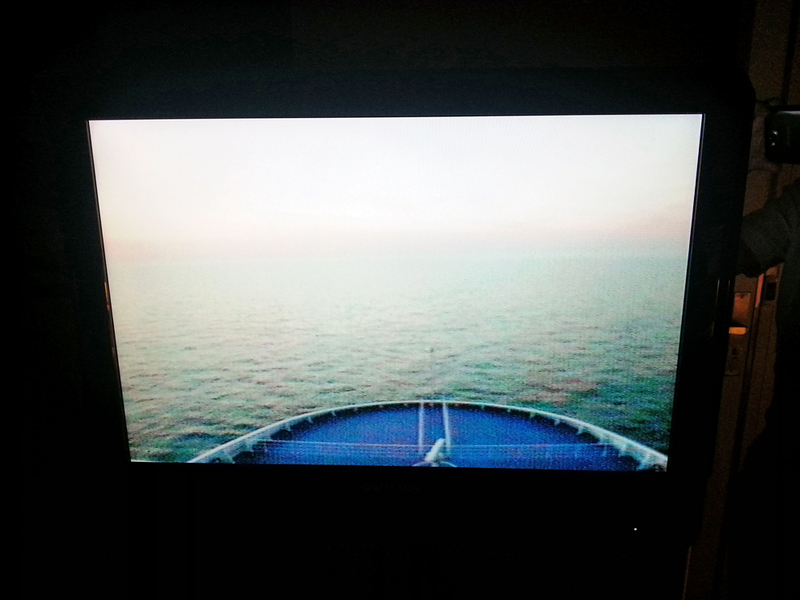 After a good nights sleep I woke at 5am and got myself ready to go out on deck to watch the sunrise. 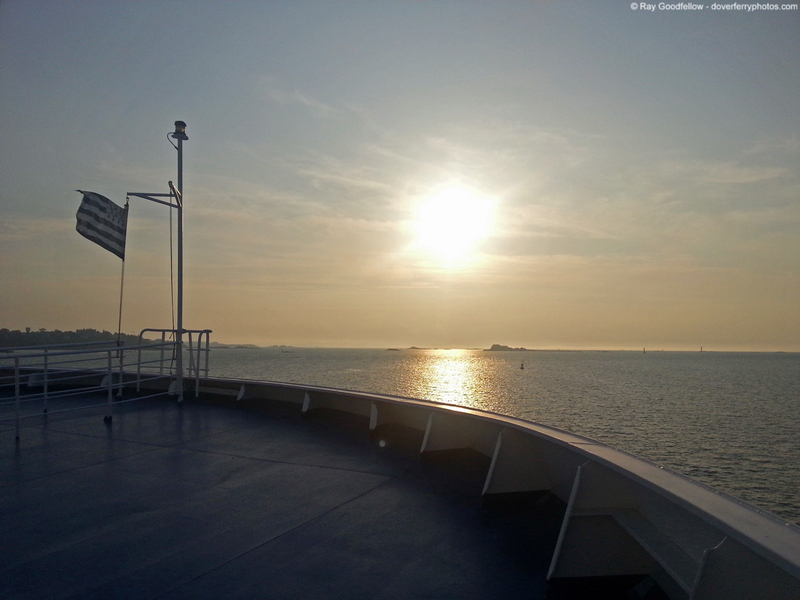 There is something I love about sunrise and sunset at sea and on this occasion I wasn’t disappointed. I mentioned earlier in this report that our cabin had a television, one of the good things about this was that we had a live feed of the ships position on a map on one station and a live video feed from the bridge on another station. All too soon the Isle of Wight came into sight and we started our approach to Portsmouth. 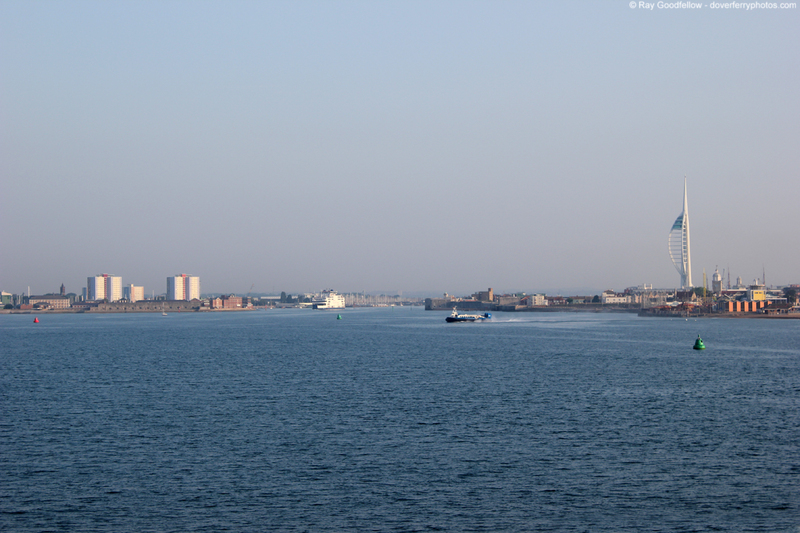 Unlike the previous day the visibility was excellent offering fantastic views as we passed the island and the approaches to Portsmouth could be clearly seen as the sun rose over Southsea. As if we didn’t eat enough the previous night we both opted to try the continental breakfast in the La Gerbe de Locronan Café on deck 8. Again everything was freshly baked and I opted for a pain au raisin with orange juice and a cup of tea, this came to £4.10, again I thought this to be good value. 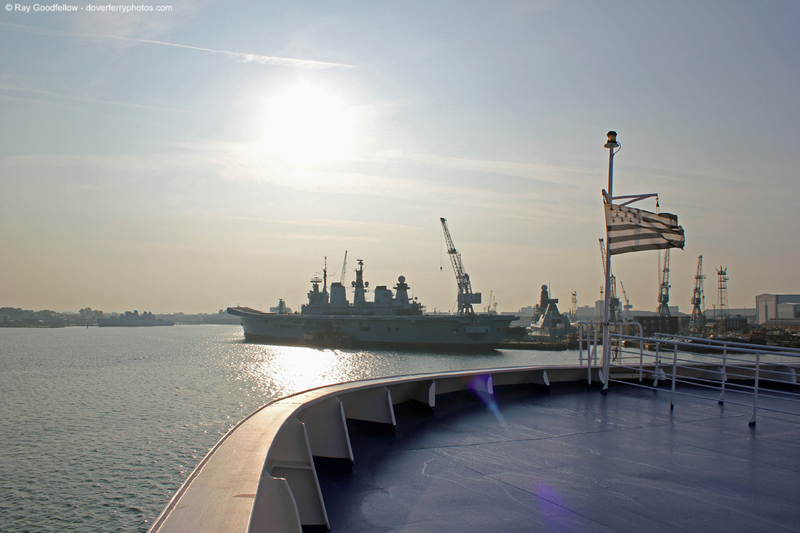 After our `Petit Déjeune’ we headed to the sundeck on the bow to witness our arrival in Portsmouth. 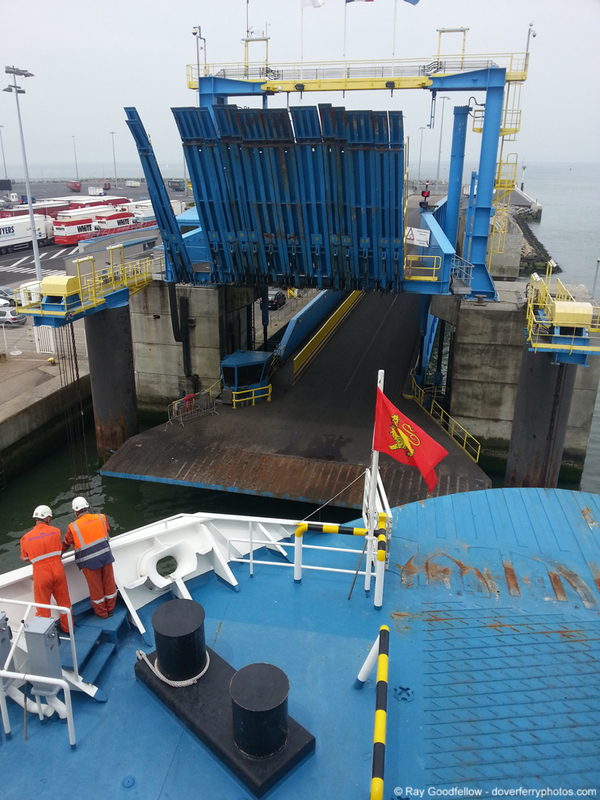 We reached the berth bang on time and all too soon we were heading down to the car deck to rejoin our vehicle. 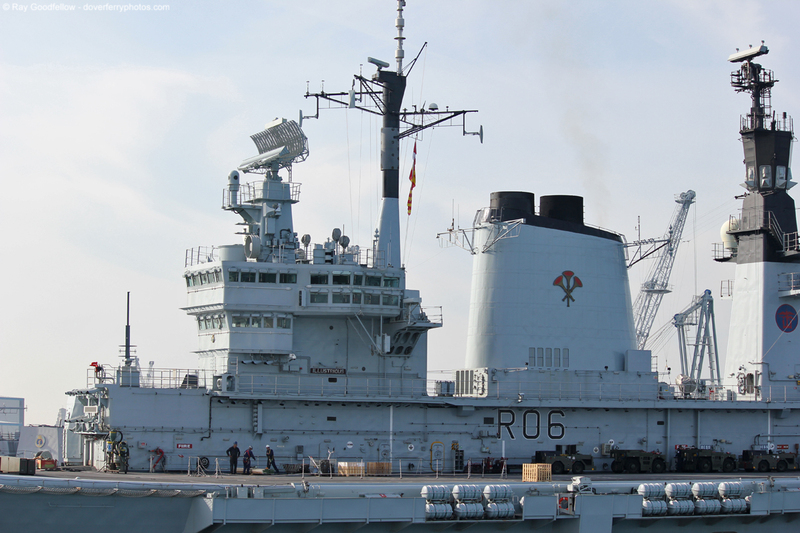 It took about 20 mins from berthing until we were driving off the ship, this was due to the main deck having to be cleared before the ramps to the upper car deck could be lowered. 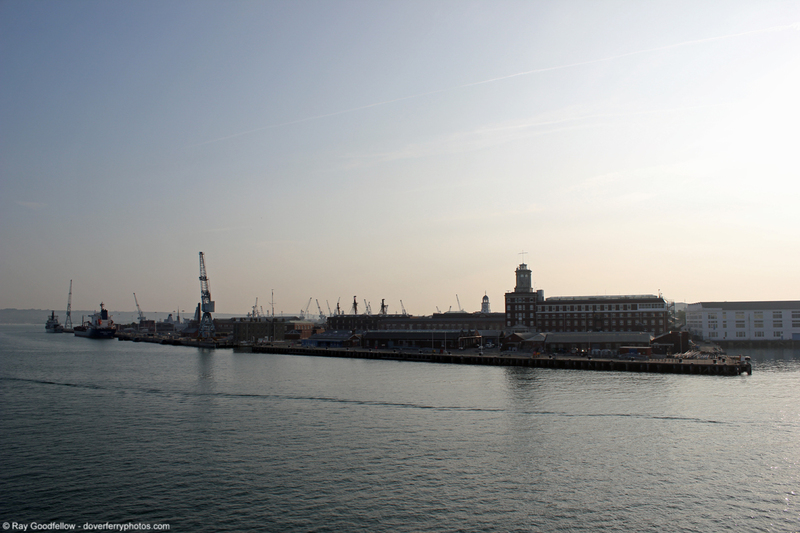 Departing the port was a painless experience, especially when compared to our last arrival in Portsmouth, The Border Agency (UKBA) actually had 9 lanes open and we were soon heading to Portsmouth seafront for a spot of photography. 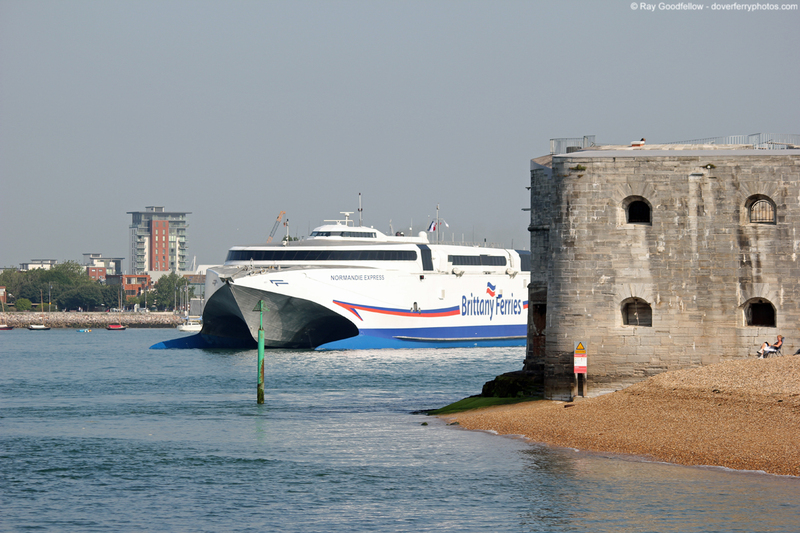 When visiting Portsmouth I always try and make a point of trying to get down to the historic seafront, principally the Round & Square Tower’s at the entrance to the harbour. 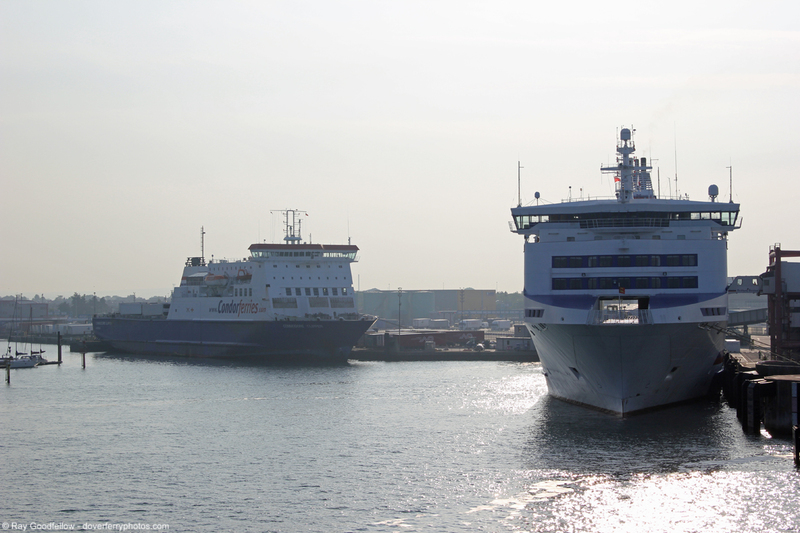 Our timing was quite good as the both the Cap Finistere and Normandie Express were due to arrive and depart respectively within the hour. 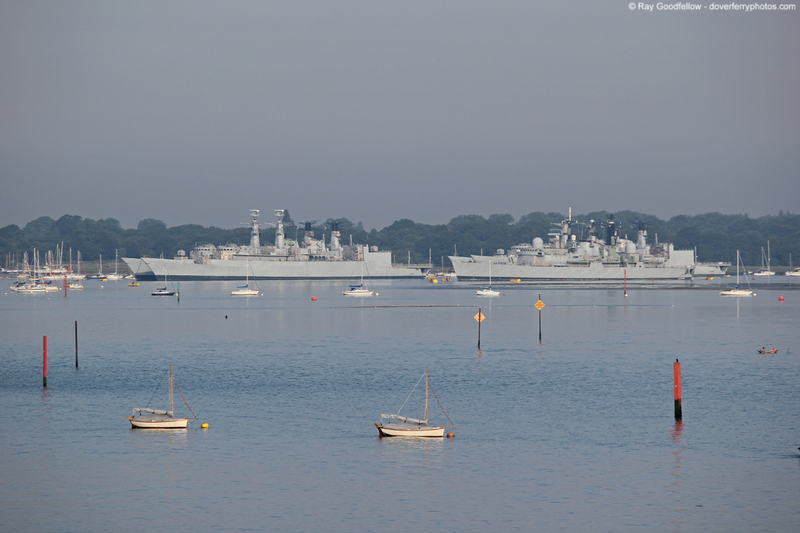 As well as these two movements there were the usual comings and goings to and from the Isle of Wight. 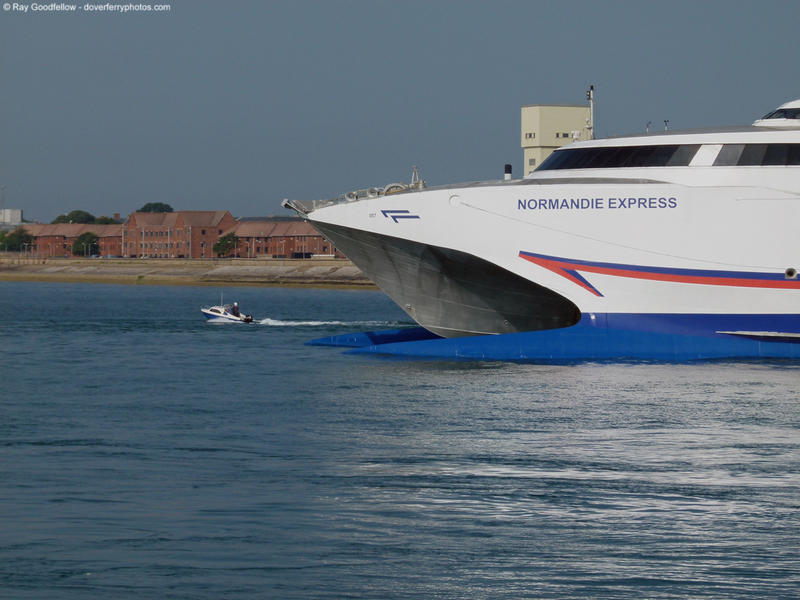 Normandie Express and the Island Express, like them, I must dash to the conclusion of this report…………..
Well what can I say in conclusion, well apart from the fact that I probably need to go on a diet after eating my own body weight in food. I have to say I enjoyed this trip greatly, it wasn’t just the food, it wasn’t just the fantastic weather, it wasn’t just the good company it was the chance to travel on two well appointed ships which offer excellent facilities and offer a quality of service which is second to none. 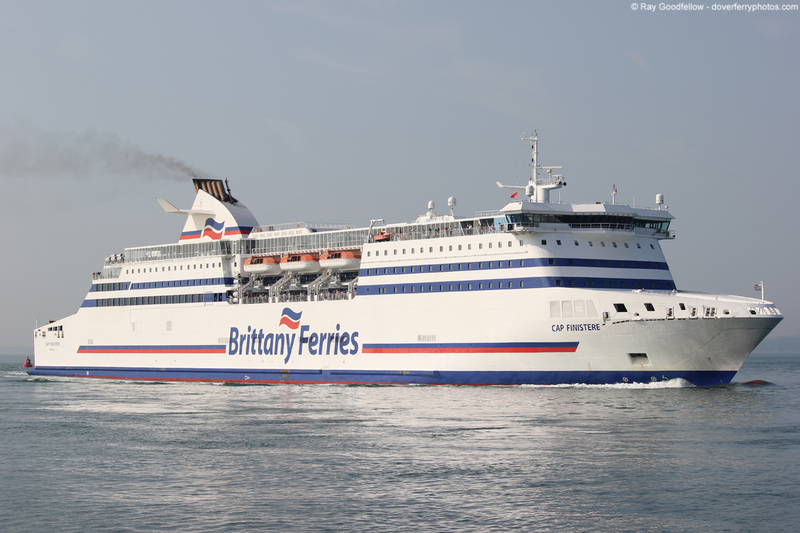 I have joined the ranks of people from the maritime community that when the subject of Brittany Ferries comes up and I am going to say “You have got to travel on the Bretagne“. 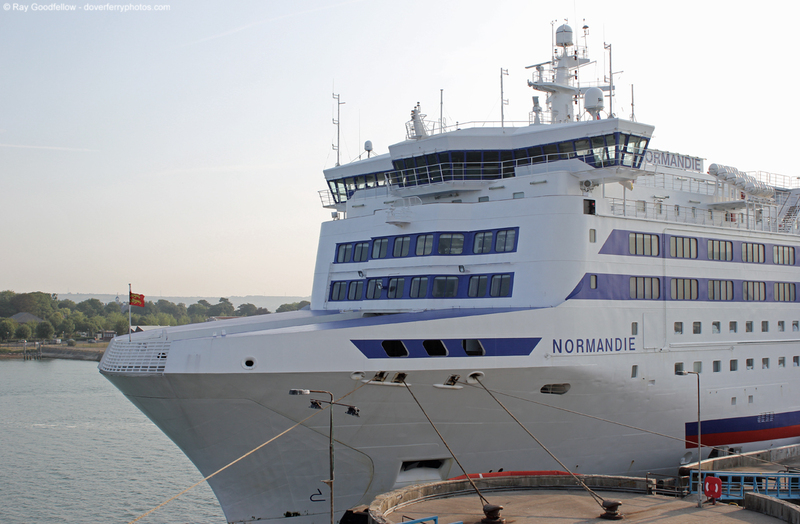 The Mont St Michel makes just a good day ship as she does a night ship, she is bright, she is modern and she is comfortable. The Bretagne is equally as impressive, yes she is an old lady now but she has a feeling of quality and a crew that obviously care for her greatly. I think the best description is that she feels homely. 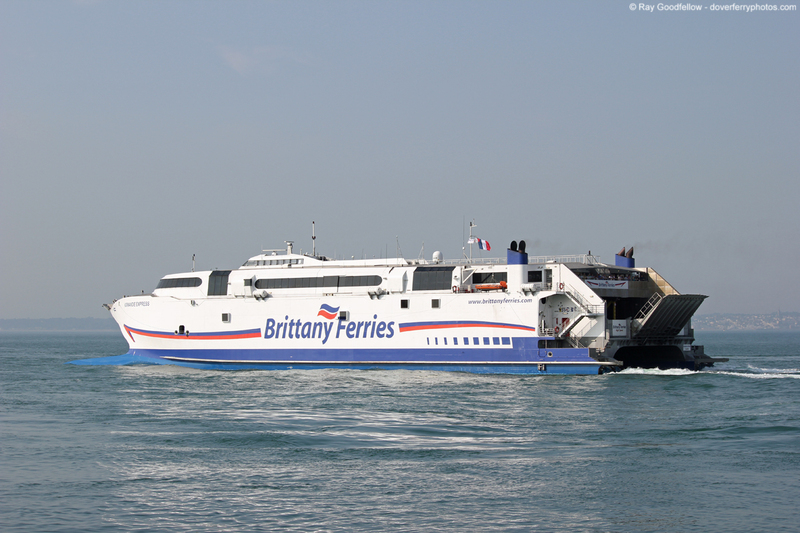 As for Brittany Ferries, I can see why they are the number one choice to travel on the Western Channel and it’s not just because they have the most routes. It’s the little things, the crews are welcoming and friendly, the ships are spotlessly clean and they excel in what they do and that’s to transport passengers from point A to point B in a comfortable and stylish environment with a bit of luxury thrown in for good measure. 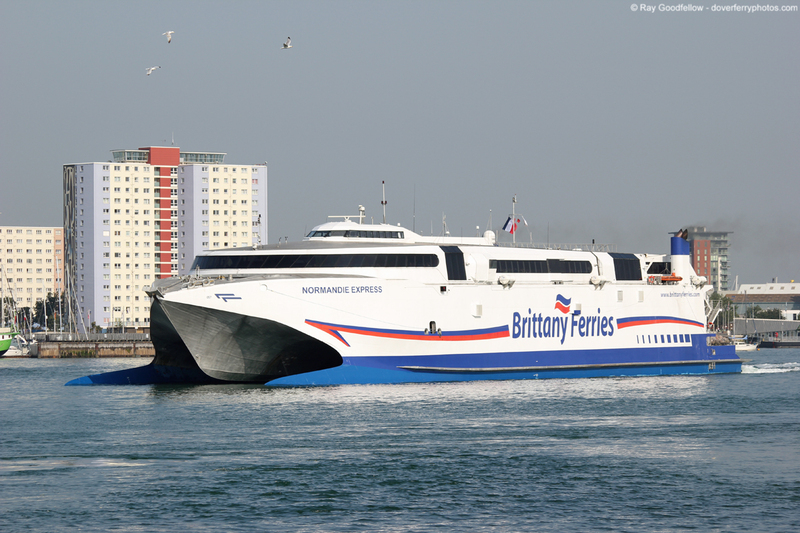 Will I be travelling with Brittany Ferries again you may ask? The answer to that is absolutely yes. I still have a few ships in the fleet I would like to experience and I am quite interested in a mini cruise to Spain on the Pont Aven at some point. I would also like to take this opportunity of thanking Paul Cloke for his company and for being my personal chauffeur during the trip. I would also like to thank Paul’s other half Rachel for not only accommodating me before the trip but for feeding me as well (Food again, seriously this is getting worrying, I might have to rename the site Dover Food Photos). 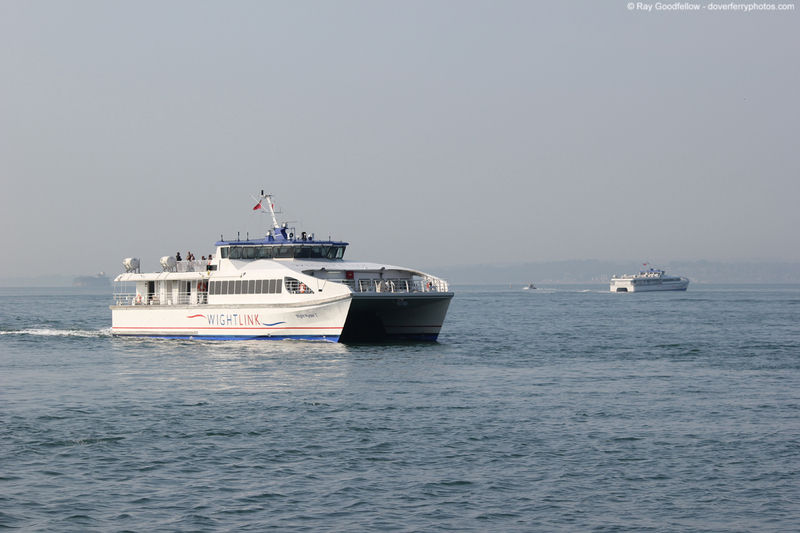 Finally a big thank you to the crews of both the Mont St Michel and Bretagne for making this a memorable trip to and from France. PS some people have already asked which route are we travelling on next, well I don’t want to spoil it but I will say it will probably involve a Swedish ferry operator, it will be a rather Celtic experience and one of the two vessels we plan to travel on has jet engines and can travel significantly quicker than the other (well that’s if fuel wasn’t so expensive)…………. 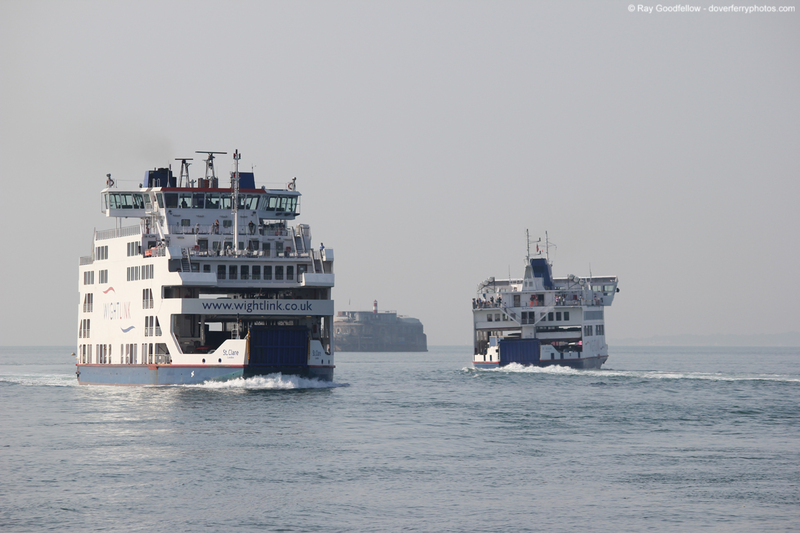 This article and all photographs herein are the copyright © of Ray Goodfellow (Dover Ferry Photos) 2013, All rights reserved. 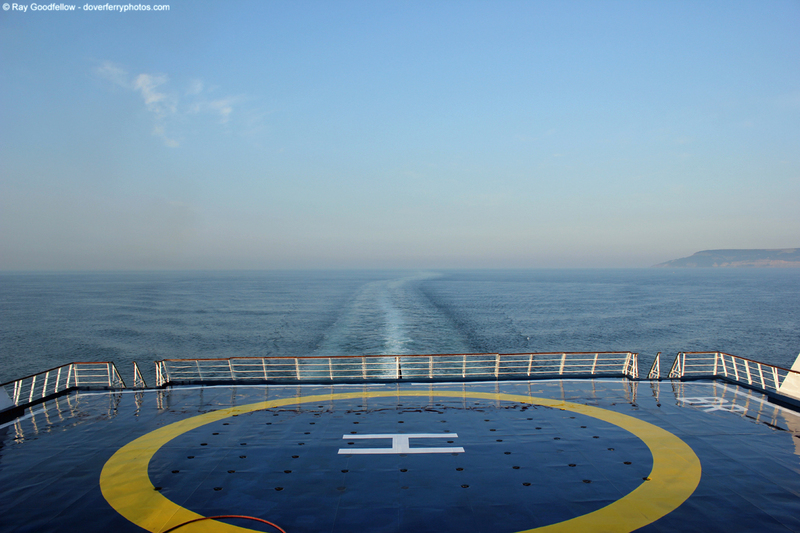 Companion have a very smooth trip across the channel. 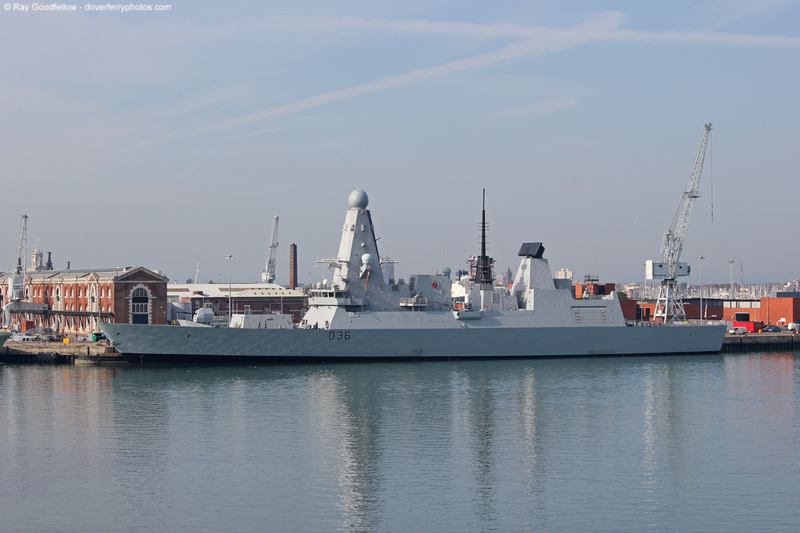 Very busy port there in Portsmouth and also a Marine harbor? 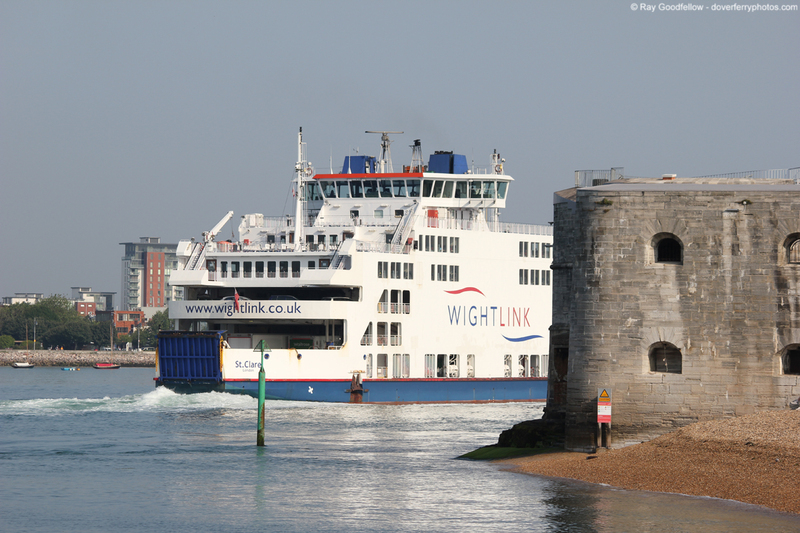 I was near by at Portsmouth in 2011 I had to load in Millbrook Cornwall, before go overthere I was driving the wrong way and came out at the Ferry and turned overthere and ask someone the road to Millbrook, very helpfull !! St Malo, what a pitty that my father past away in 2004 he was there during the second world war to work for the Germans with many others, we had plans in those years (2000) to go back to St. Malo and Normandy with him but it never came up to do so. For myself yes i like to go overthere but in a quit season of the year not in June somewhere in september. I’ve reed also your post update and you are doing it at night, well I do also updating at night for the same reason you added. and rain etc. So we hope for some cooler weather also good for the computers we have already done a lot to keep the processor cool and also the memory blocks. With kind regards, Henk from a hot Moordrecht. Good to hear from you. Thank you for the kind words about my voyage report. It really was a great trip, one of the more memorable ones and for the right reasons. 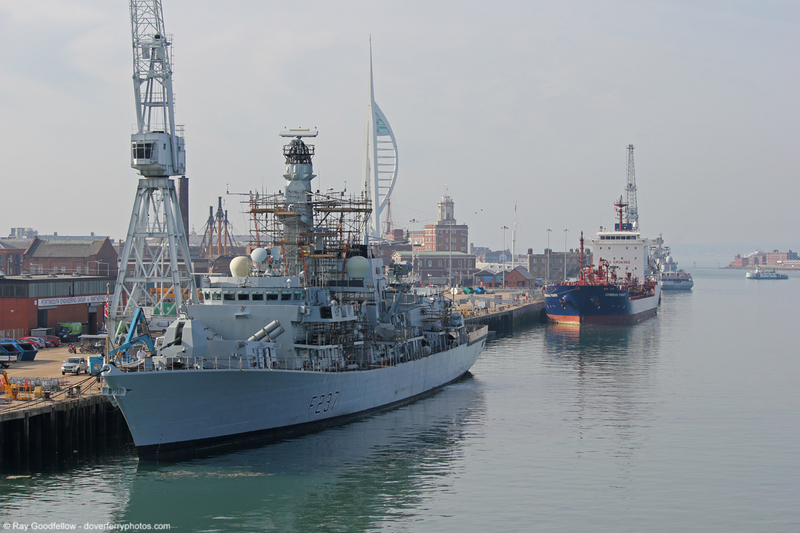 Portsmouth is a fairly busy port, not just with the numerous ferry and Isle of Wight ferry movements but with the Navy vessels and the reefer ships delivering bananas as well. We visited Normandy back in May as well and it was a lot quieter than it would have been in June. We were lucky really because a few days before we were in St Malo the Tour de France was in the area and that would have made our journey next to impossible. I lost my father a few years ago as well and I would have liked to have travelled with him to Normandy as he was very interested in the history of the dark days of the 1940s, I know it probably sounds strange but whenever I am in the Normandy I feel like my dad is with me. 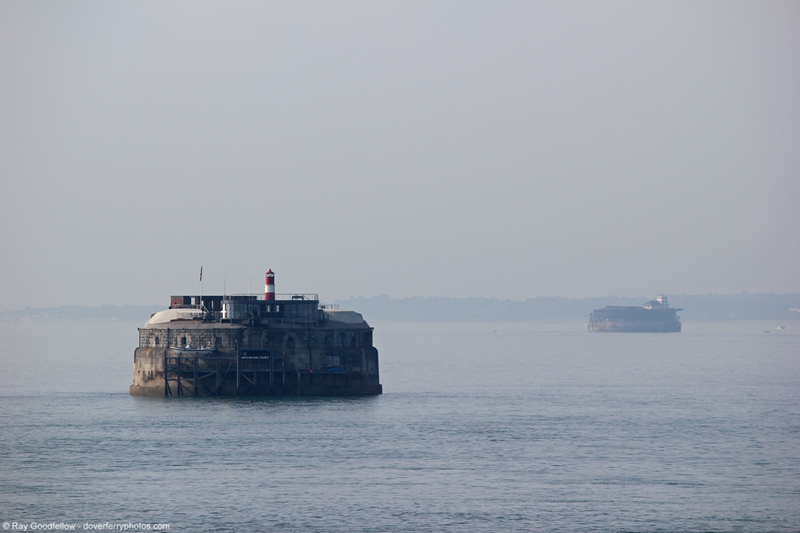 I would like to go back to the Normandy coast and St Malo to explore the area in the future. I think it would be a nice place for a holiday, its a picturesque place, the people are really nice and the food is amazing (I have really got to get over this food obsession Haha). Hi Ray thanks for the reply, I lost my father in august 2004 just after my holiday in Southern Austria, he told me in the hospital many stories about his time in France and i will never forget them. 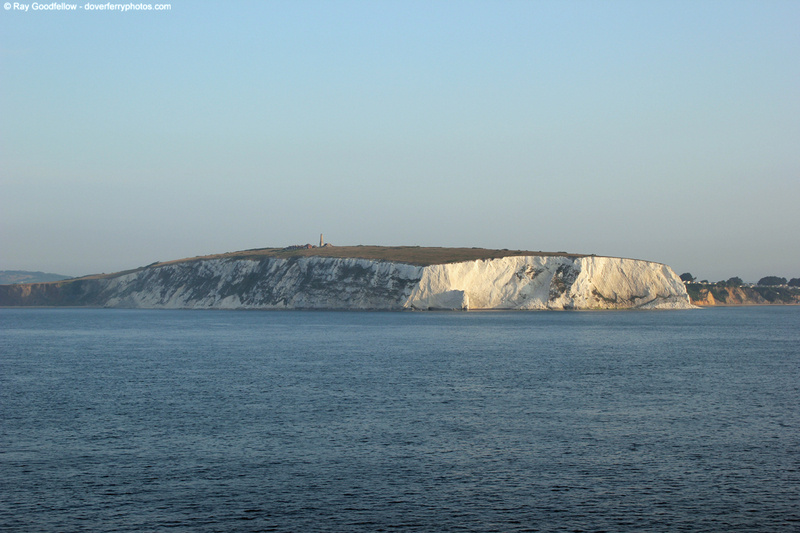 But when my personal situation is going better (financial) we will go to France and of course we will take a trip to Dover from Dunkirk, just a little touring in the area and so on. So now i’m going outside to cool off a little bit, ha ha outside its 26 degrees at the moment here and we are an hour further up than you on the other side. oh by the way do you see also that facebook comments? Ellie Bos is my wife she’s on facebook, i’m not on facebook. I agree with you there about keeping on smiling and looking to better days. Our whole family had a rough time of it when Dad passed away in 2011. He had been seriously ill for a couple of years before be passed and it really affected all of us. I trust that those brighter days make an appearance for you soon Henk. 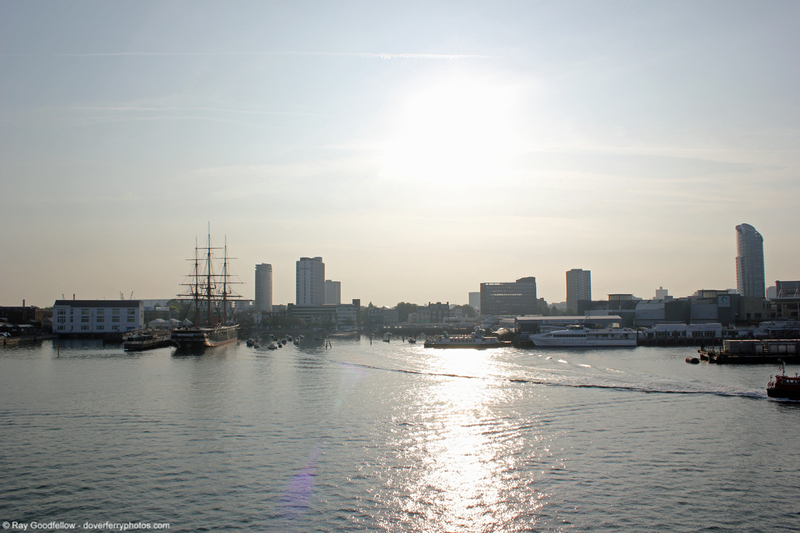 ……..and we are living just a 30 min drive from the coast, The Hague or Hook of Holland. Yes Ray lost a member from the family so close to you its never be the same again but that’s live! (they tell me once) but i do still sometime missing him. 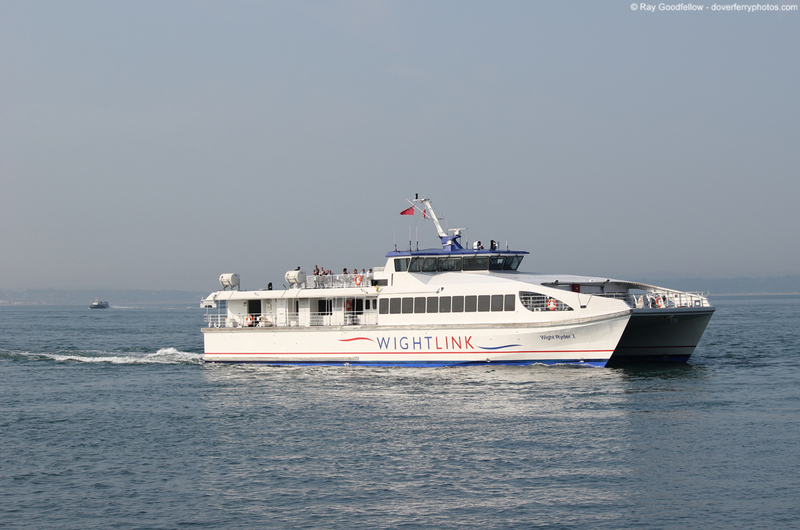 A bad guy is stalking my two main characters, Greg and Margaux, who are taking BF’s Normandie from Caen to Portsmouth. They don’t know the Bad Guy is on board, and I wanted to put them in a little danger before they arrive in the UK. Since the couple had been snogging a bit in the previous chapter, I thought I’d send Greg out of their cabin for something so the Bad Guy could spot him. Condoms were my first choice for him to buy, but it could be a bottle of wine if necessary. I know they sell wine in The Big Shop, but I haven’t seen a mention of condoms sold on the ferries in any of my online searches. Any info you have in that regard would be very helpful. Oh the questions you get asked running a website! lol. I have to admit that I have never seen condoms for sale on a ferry but then again maybe that’s because I have never needed them whilst travelling? The shops on the ferries do sell a whole myriad of products and it is quiet possible that these could be available to buy. 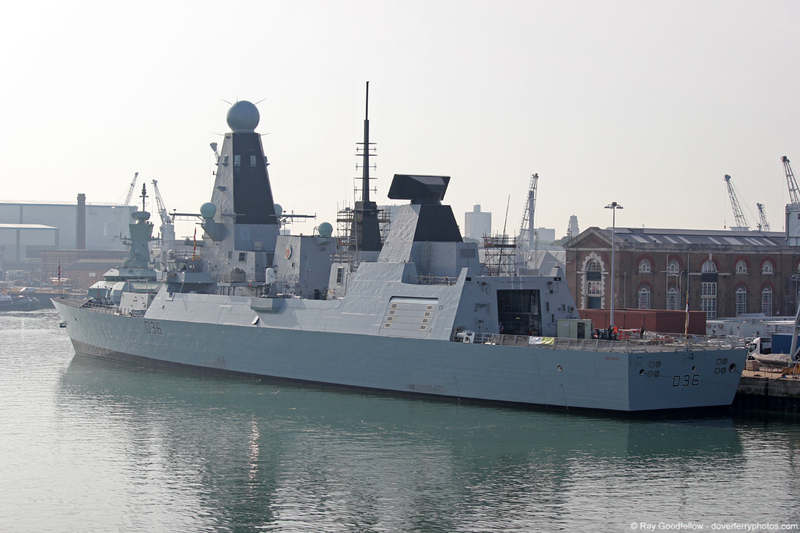 I can’t see why a ship running an overnight crossing would be any different to any hotel to be honest. Actually, Ray, I do have one more question. 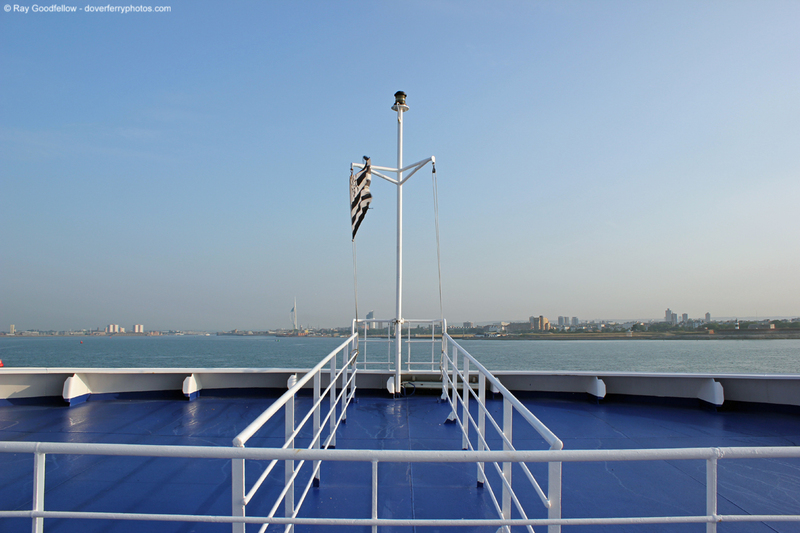 How is the exit from the ship handled if you are in a car? I’m talking about the customs area. Do cars drive somewhere, park, bring their luggage in, etc.? Or is it more casual, drive up to a customs agent, show their passports, declare items while sitting in their car seat, etc.? Any hints as to the procedure? 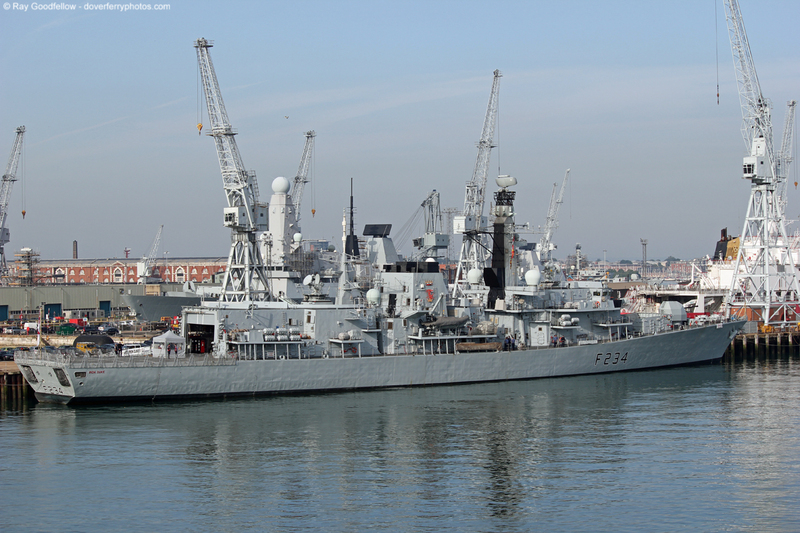 Are you talking about arrival in Caen or Portsmouth? 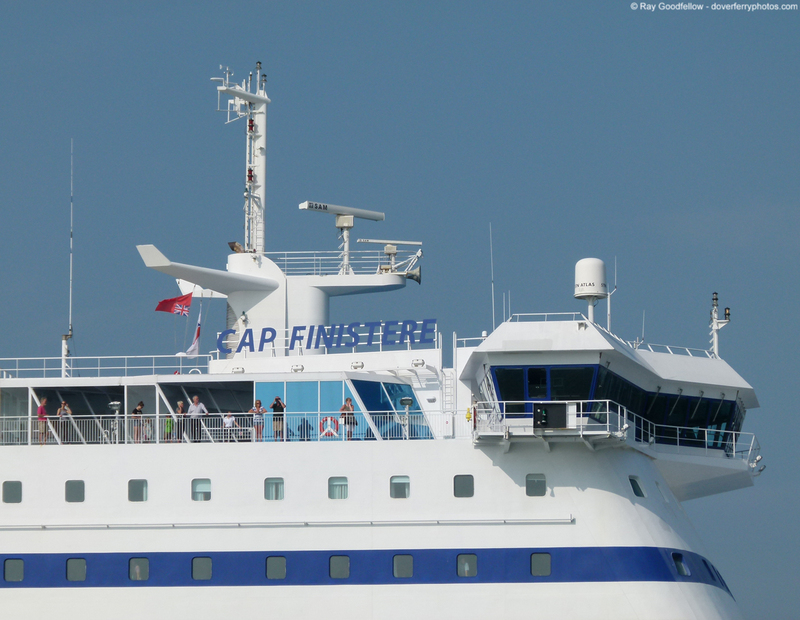 In Caen you drive off the ship and present your passport at the immigration kiosk if it’s manned and once the necessary checks have been completed (either the passport scanned or just visually inspected) you leave the port. At Portsmouth you drive off the ship and head towards the immigration controls and present your passport, the passport will be scanned and then you proceed through customs here vehicles are usually randomly selected for searches or the customs agent will stop and ask the usual questions of where have you been, what was the purpose of your trip etc etc. 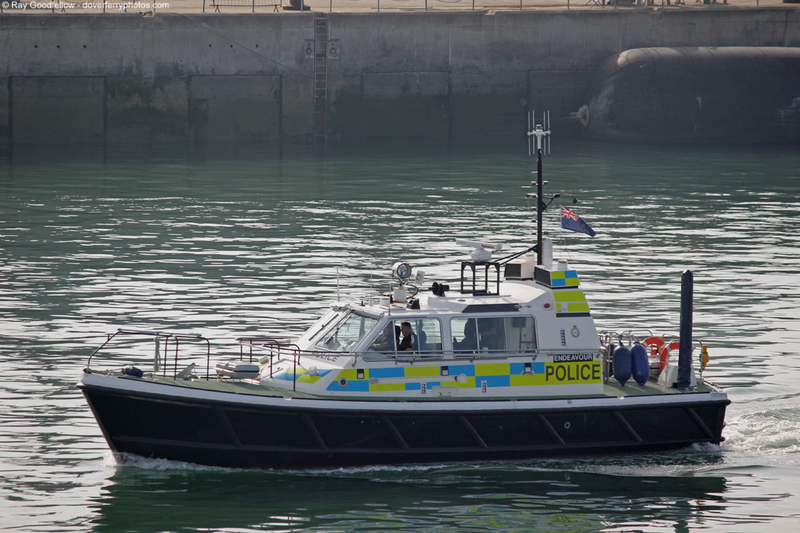 Depending what the outcome is the vehicle will be taken into the customs shed for searching. I can’t really give any details of this as I have only ever been stopped the once and that didn’t require a search. As immigration and customs now fall under the remit of the UK Border Agency (UKBA) I would presume you `declare’ if required to do so when presenting your passport to the immigration officers. Things here in Dover are a bit different as the UK Border controls are situated in Calais so you present your passport before boarding the ferry in France. Upon arrival you drive through customs and vehicles are randomly stopped for questioning and searching. It’s simple to say searches are `random’ but I think a lot of the work of the UKBA is now `intelligence’ led and that profiling is used to a fair extent as well. This is perfect information, exactly what I need. I had a blank spot after the previous chapter. Now I can move forward.